Questions to consider Is the severity of spasticity increasing with stretch, position changes, transfers or with muscle contractions often elicited with ambulation? Is clonus + or – Is patient experiencing upper extremity spasticity? How do you determine the daily pattern? sleep pattern issues: rising time, bedtime activities that elicit spasticity, i.e. bath time Is there any time of the day when patient is lethargic? How do you perform the conversion from a simple continuous rate to a flex rate – does the daily dose stay the same? Identify the current daily dose and concentration of the drug in the pump This will determine minimal basal rate: 500mcg/ml=1mcg/hour basal rate 2000mcg/ml=4mcg/hour basal rate Daily dose-basal rate (according to concentration)/#of boluses (every 6 hours is standard due to half life of ITB)= mcg of bolus dose With the introduction of bolus dosing, I most often will not increase the daily rate. 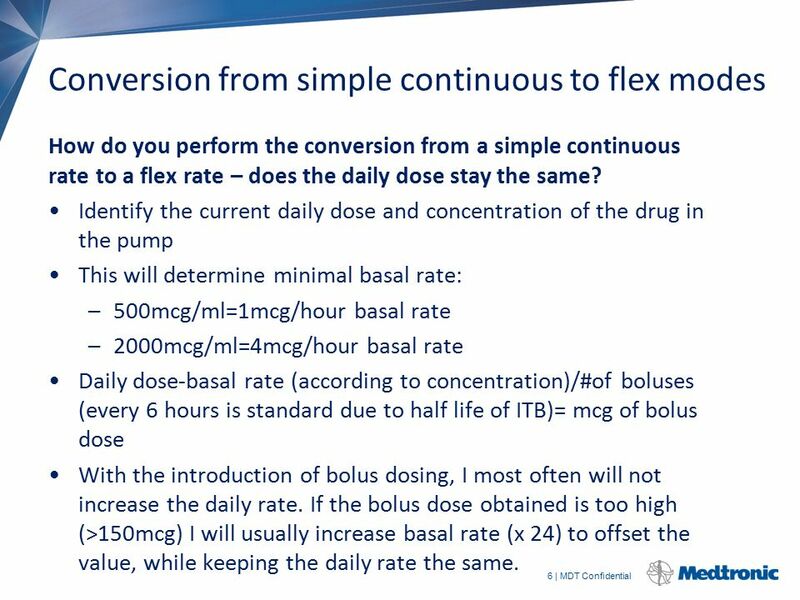 If the bolus dose obtained is too high (>150mcg) I will usually increase basal rate (x 24) to offset the value, while keeping the daily rate the same. 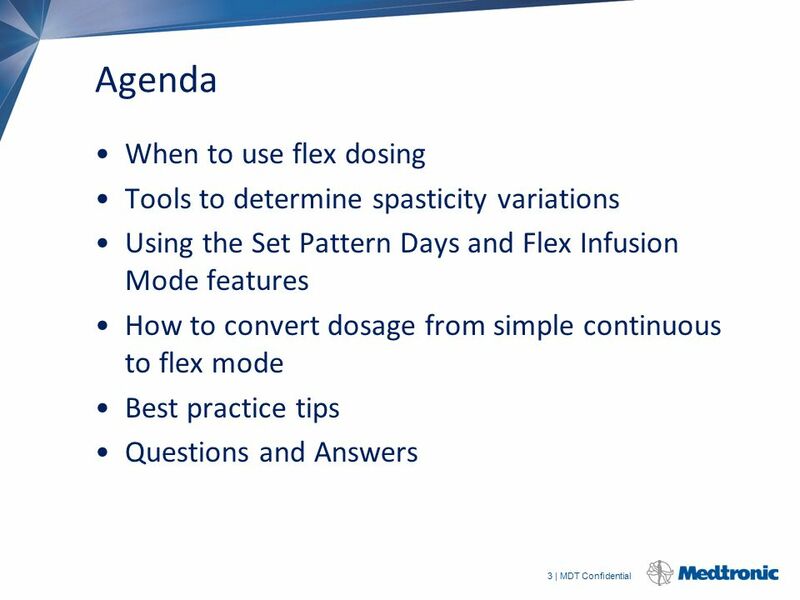 How do you determine if the flex dosing mode is working for the patients? 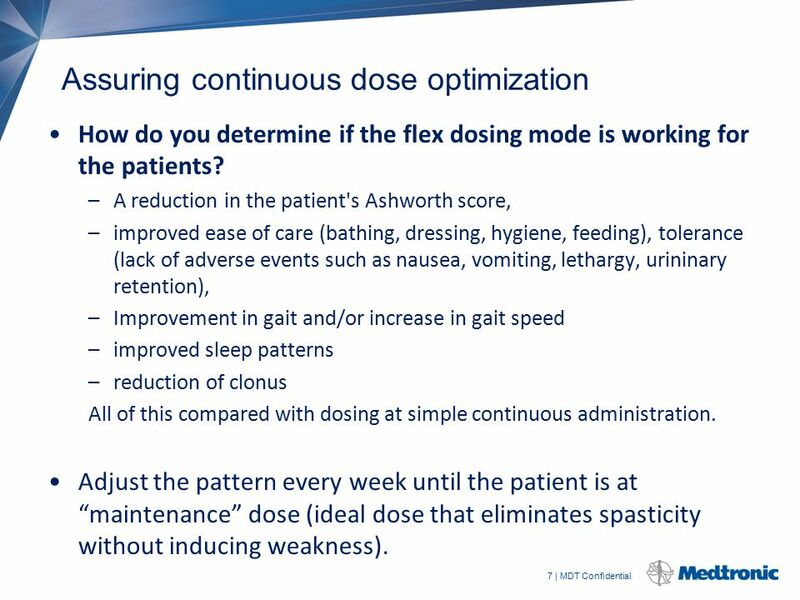 A reduction in the patient's Ashworth score, improved ease of care (bathing, dressing, hygiene, feeding), tolerance (lack of adverse events such as nausea, vomiting, lethargy, urininary retention), Improvement in gait and/or increase in gait speed improved sleep patterns reduction of clonus All of this compared with dosing at simple continuous administration. Adjust the pattern every week until the patient is at “maintenance” dose (ideal dose that eliminates spasticity without inducing weakness). 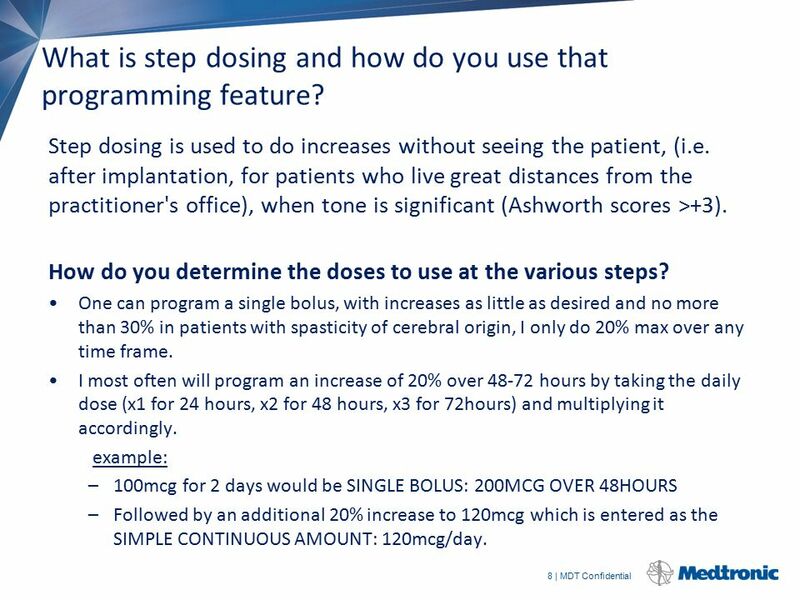 8 What is step dosing and how do you use that programming feature? Step dosing is used to do increases without seeing the patient, (i.e. after implantation, for patients who live great distances from the practitioner's office), when tone is significant (Ashworth scores >+3). How do you determine the doses to use at the various steps? One can program a single bolus, with increases as little as desired and no more than 30% in patients with spasticity of cerebral origin, I only do 20% max over any time frame. I most often will program an increase of 20% over hours by taking the daily dose (x1 for 24 hours, x2 for 48 hours, x3 for 72hours) and multiplying it accordingly. example: 100mcg for 2 days would be SINGLE BOLUS: 200MCG OVER 48HOURS Followed by an additional 20% increase to 120mcg which is entered as the SIMPLE CONTINUOUS AMOUNT: 120mcg/day. See all patients with pumps in same time block/same day of week Aids in organization Improves efficiency of procedure time Allows for patient comparison See patients weekly until at maintenance dose. 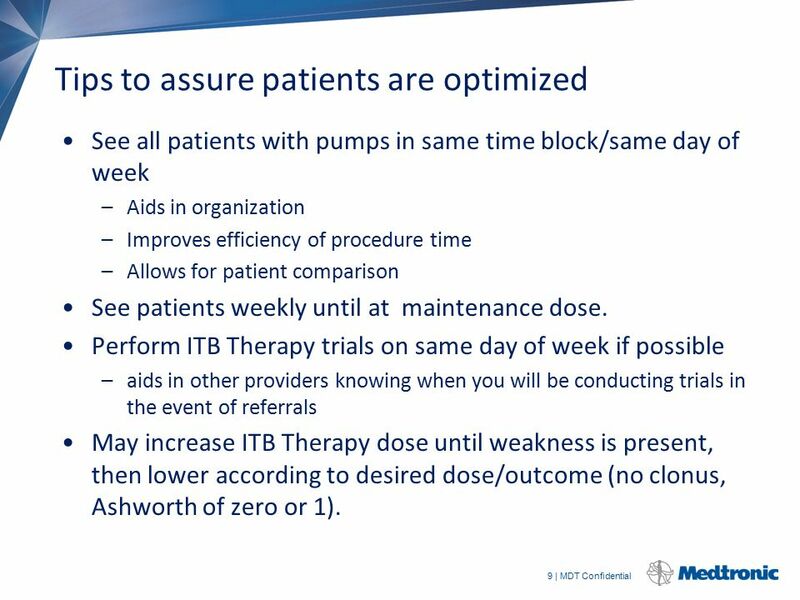 Perform ITB Therapy trials on same day of week if possible aids in other providers knowing when you will be conducting trials in the event of referrals May increase ITB Therapy dose until weakness is present, then lower according to desired dose/outcome (no clonus, Ashworth of zero or 1). 10 Additional Tips Review signs and symptoms of overdose or withdrawal at each visit. Provide patients with a prescription for baclofen tablets (10mg), especially if traveling, while providing instructions for when to use and frequency of dosing and to call you immediately if experiencing symptoms of withdrawal. Review protocol of how to reach managing provider with each visit. Use PT/OT for feedback. I usually have patients seen in our spasticity clinic once they are what I perceive as at maintenance dose as therapists can evaluate their spasticity and provide feedback. Baclofen is a white to off-white, odorless or practically odorless crystalline powder, with a molecular weight of It is slightly soluble in water, very slightly soluble in methanol, and insoluble in chloroform. 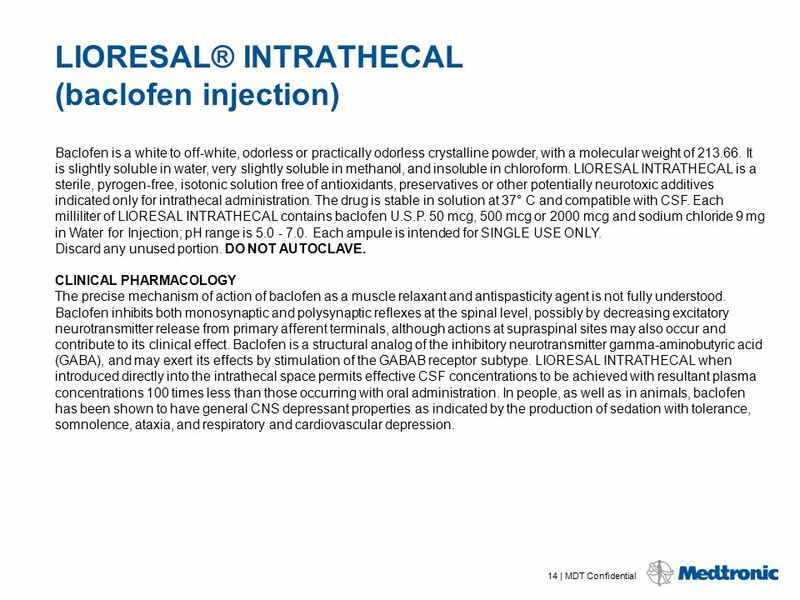 LIORESAL INTRATHECAL is a sterile, pyrogen-free, isotonic solution free of antioxidants, preservatives or other potentially neurotoxic additives indicated only for intrathecal administration. The drug is stable in solution at 37° C and compatible with CSF. 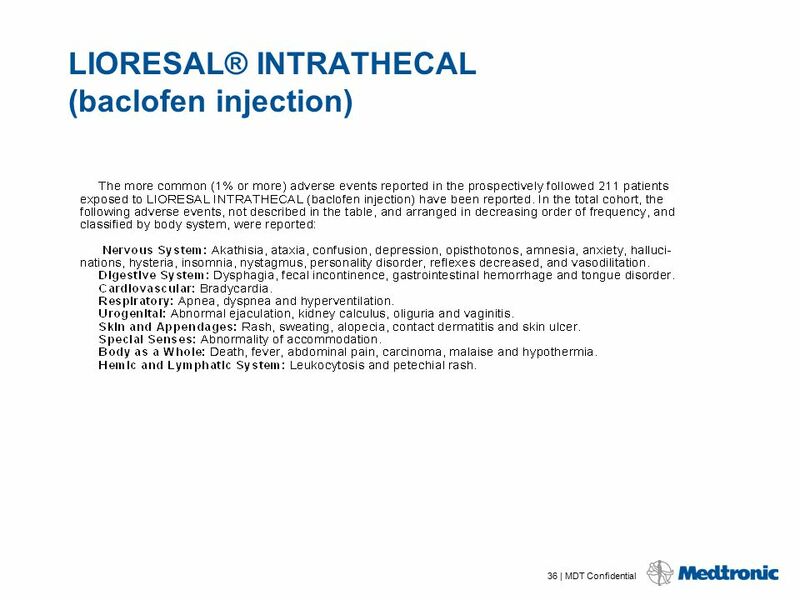 Each milliliter of LIORESAL INTRATHECAL contains baclofen U.S.P. 50 mcg, 500 mcg or 2000 mcg and sodium chloride 9 mg in Water for Injection; pH range is Each ampule is intended for SINGLE USE ONLY. Discard any unused portion. DO NOT AUTOCLAVE. CLINICAL PHARMACOLOGY The precise mechanism of action of baclofen as a muscle relaxant and antispasticity agent is not fully understood. Baclofen inhibits both monosynaptic and polysynaptic reflexes at the spinal level, possibly by decreasing excitatory neurotransmitter release from primary afferent terminals, although actions at supraspinal sites may also occur and contribute to its clinical effect. Baclofen is a structural analog of the inhibitory neurotransmitter gamma-aminobutyric acid (GABA), and may exert its effects by stimulation of the GABAB receptor subtype. 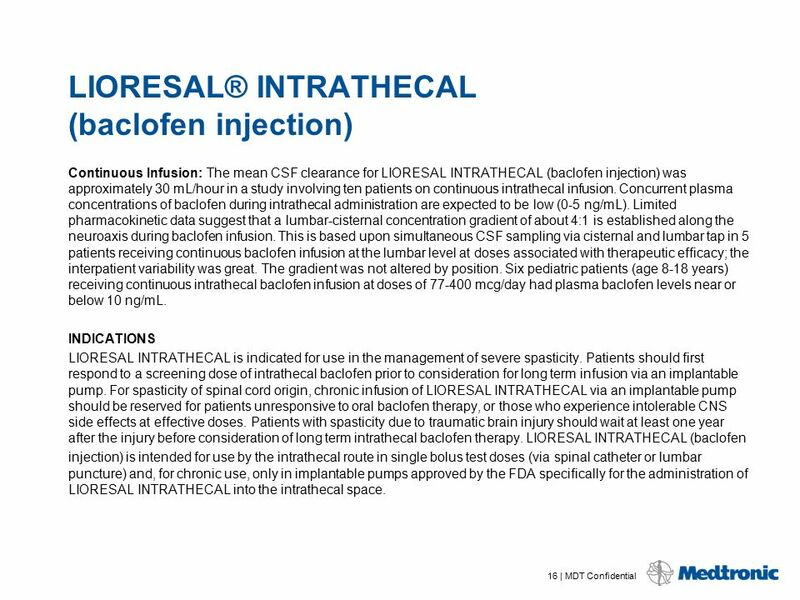 LIORESAL INTRATHECAL when introduced directly into the intrathecal space permits effective CSF concentrations to be achieved with resultant plasma concentrations 100 times less than those occurring with oral administration. In people, as well as in animals, baclofen has been shown to have general CNS depressant properties as indicated by the production of sedation with tolerance, somnolence, ataxia, and respiratory and cardiovascular depression. Pharmacodynamics of LIORESAL INTRATHECAL: Intrathecal Bolus: Adult Patients: The onset of action is generally one-half hour to one hour after an intrathecal bolus. Peak spasmolytic effect is seen at approximately four hours after dosing and effects may last four to eight hours. Onset, peak response, and duration of action may vary with individual patients depending on the dose and severity of symptoms. Pediatric Patients: The onset, peak response and duration of action is similar to those seen in adult patients. Continuous Infusion: LIORESAL INTRATHECAL’S antispastic action is first seen at 6 to 8 hours after initiation of continuous infusion. Maximum activity is observed in 24 to 48 hours. 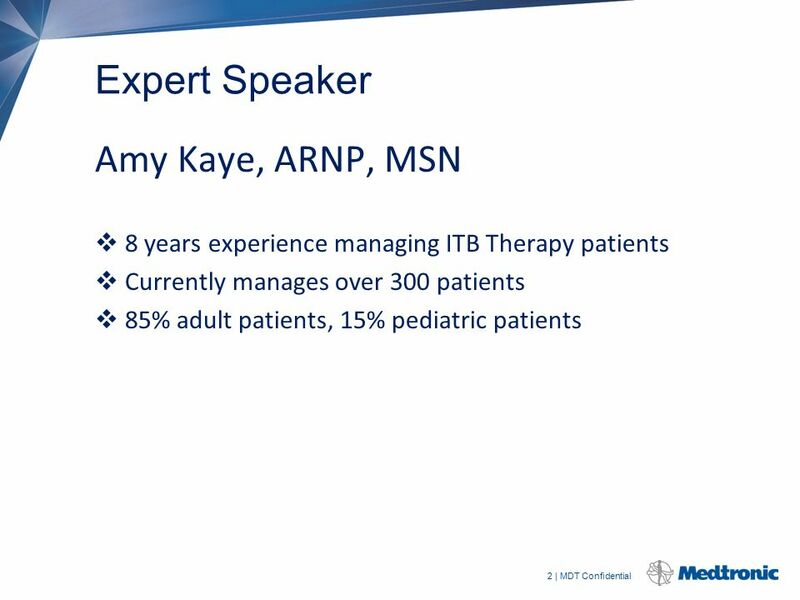 Continuous Infusion: No additional information is available for pediatric patients. Pharmacokinetics of LIORESAL INTRATHECAL: The pharmacokinetics of CSF clearance of LIORESAL INTRATHECAL calculated from intrathecal bolus or continuous infusion studies approximates CSF turnover, suggesting elimination is by bulkflow removal of CSF. 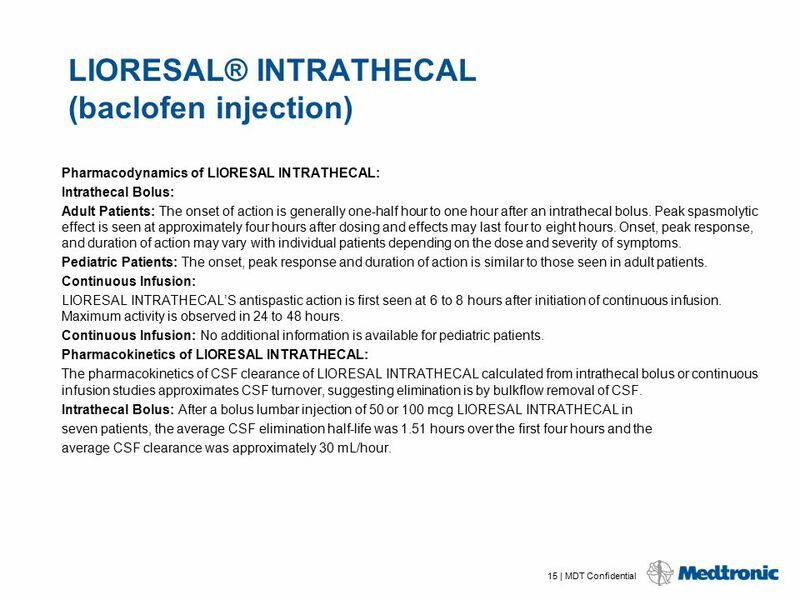 Intrathecal Bolus: After a bolus lumbar injection of 50 or 100 mcg LIORESAL INTRATHECAL in seven patients, the average CSF elimination half-life was 1.51 hours over the first four hours and the average CSF clearance was approximately 30 mL/hour. 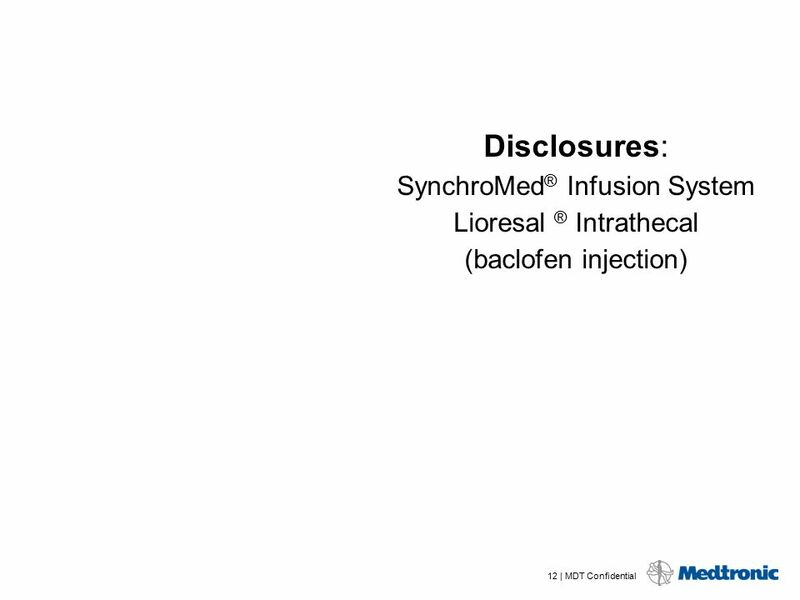 Continuous Infusion: The mean CSF clearance for LIORESAL INTRATHECAL (baclofen injection) was approximately 30 mL/hour in a study involving ten patients on continuous intrathecal infusion. 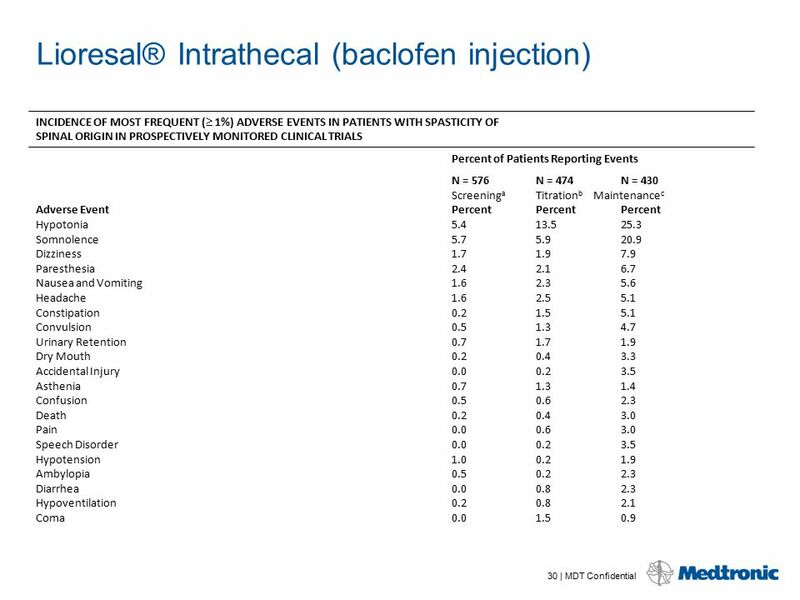 Concurrent plasma concentrations of baclofen during intrathecal administration are expected to be low (0-5 ng/mL). Limited pharmacokinetic data suggest that a lumbar-cisternal concentration gradient of about 4:1 is established along the neuroaxis during baclofen infusion. This is based upon simultaneous CSF sampling via cisternal and lumbar tap in 5 patients receiving continuous baclofen infusion at the lumbar level at doses associated with therapeutic efficacy; the interpatient variability was great. The gradient was not altered by position. 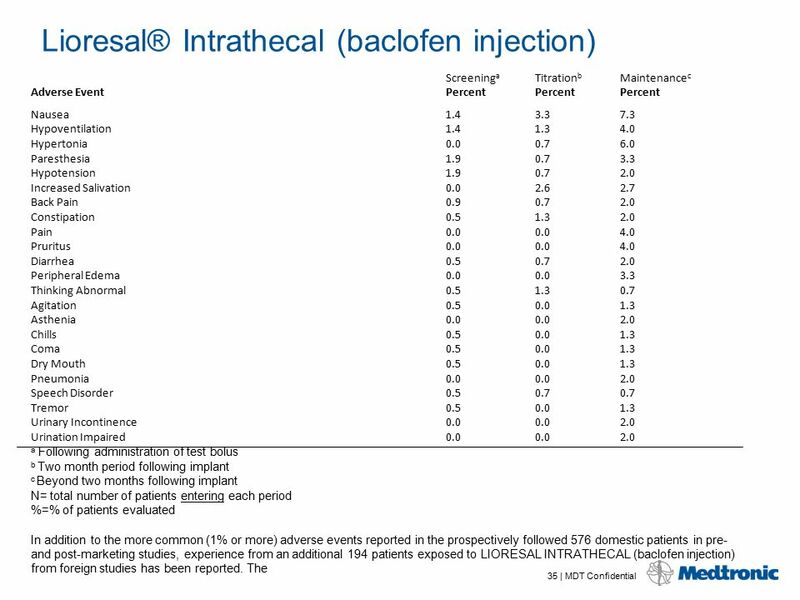 Six pediatric patients (age 8-18 years) receiving continuous intrathecal baclofen infusion at doses of mcg/day had plasma baclofen levels near or below 10 ng/mL. INDICATIONS LIORESAL INTRATHECAL is indicated for use in the management of severe spasticity. 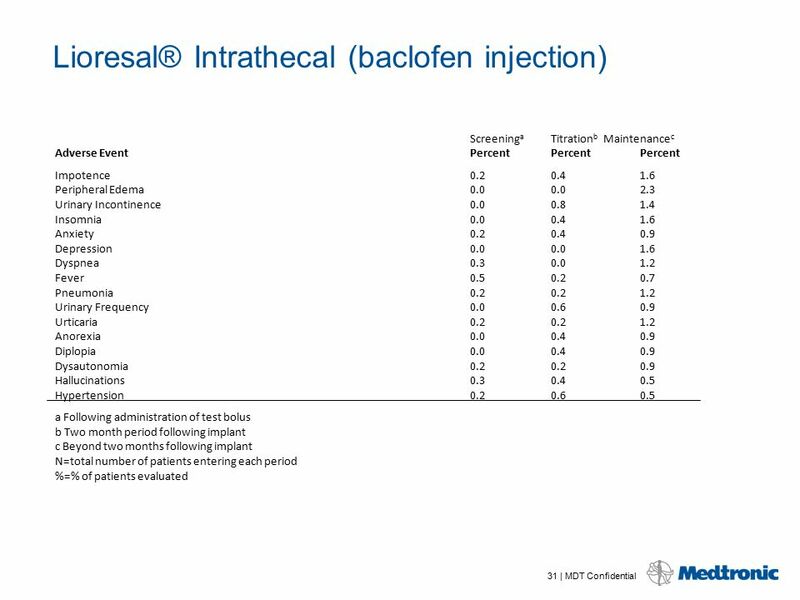 Patients should first respond to a screening dose of intrathecal baclofen prior to consideration for long term infusion via an implantable pump. For spasticity of spinal cord origin, chronic infusion of LIORESAL INTRATHECAL via an implantable pump should be reserved for patients unresponsive to oral baclofen therapy, or those who experience intolerable CNS side effects at effective doses. Patients with spasticity due to traumatic brain injury should wait at least one year after the injury before consideration of long term intrathecal baclofen therapy. 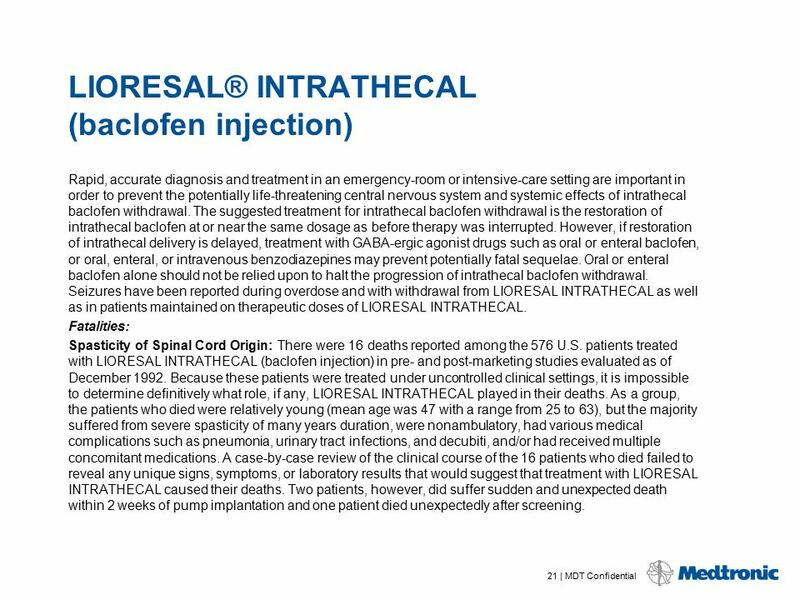 LIORESAL INTRATHECAL (baclofen injection) is intended for use by the intrathecal route in single bolus test doses (via spinal catheter or lumbar puncture) and, for chronic use, only in implantable pumps approved by the FDA specifically for the administration of LIORESAL INTRATHECAL into the intrathecal space. Spasticity of Spinal Cord Origin: Evidence supporting the efficacy of LIORESAL INTRATHECAL was obtained in randomized, controlled investigations that compared the effects of either a single intrathecal dose or a three day intrathecal infusion of LIORESAL INTRATHECAL to placebo in patients with severe spasticity and spasms due to either spinal cord trauma or multiple sclerosis. LIORESAL INTRATHECAL was superior to placebo on both principal outcome measures employed: change from baseline in the Ashworth rating of spasticity and the frequency of spasms. Spasticity of Cerebral Origin: The efficacy of LIORESAL INTRATHECAL was investigated in three controlled clinical trials; two enrolled patients with cerebral palsy and one enrolled patients with spasticity due to previous brain injury. The first study, a randomized controlled cross-over trial of 51 patients with cerebral palsy, provided strong, statistically significant results; LIORESAL INTRATHECAL was superior to placebo in reducing spasticity as measured by the Ashworth Scale. A second cross-over study was conducted in 11 patients with spasticity arising from brain injury. Despite the small sample size, the study yielded a nearly significant test statistic (p=0.066) and provided directionally favorable results. The last study, however, did not provide data that could be reliably analyzed. LIORESAL INTRATHECAL therapy may be considered an alternative to destructive neurosurgical procedures. 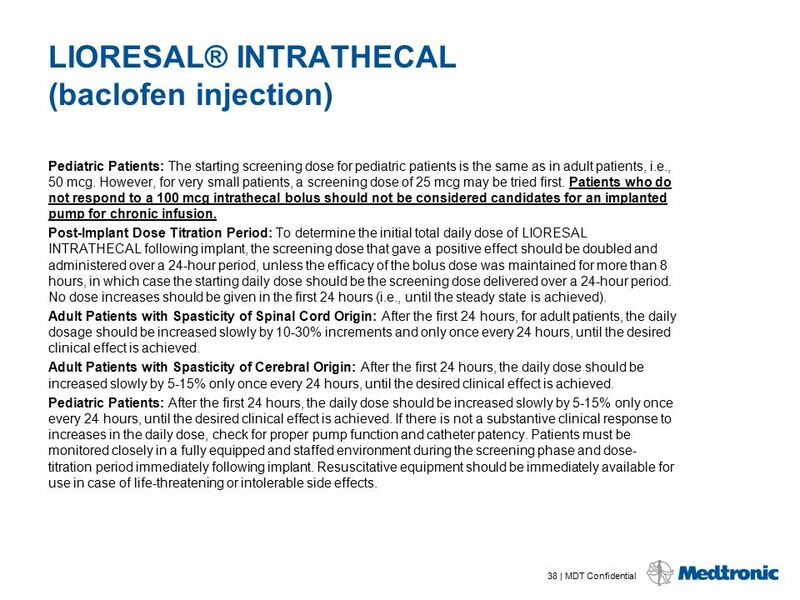 Prior to implantation of a device for chronic intrathecal infusion of LIORESAL INTRATHECAL, patients must show a response to LIORESAL INTRATHECAL in a screening trial (see Dosage and Administration). 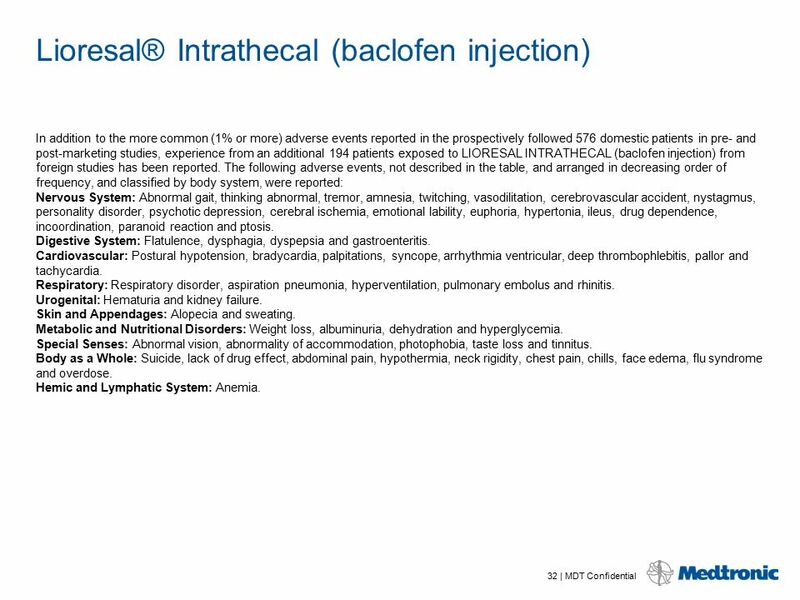 CONTRAINDICATIONS Hypersensitivity to baclofen. 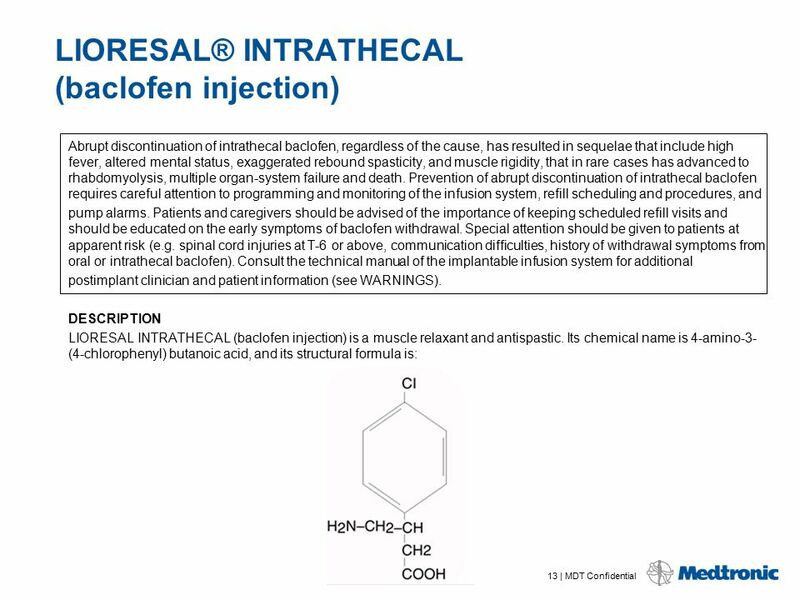 LIORESAL INTRATHECAL is not recommended for intravenous, intramuscular, subcutaneous or epidural administration. 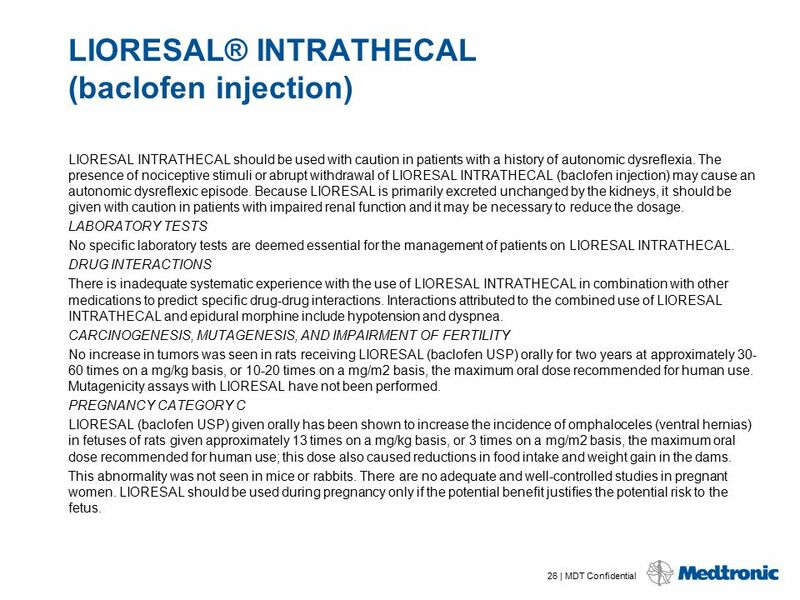 WARNINGS LIORESAL INTRATHECAL is for use in single bolus intrathecal injections (via a catheter placed in the lumbar intrathecal space or injection by lumbar puncture) and in implantable pumps approved by the FDA specifically for the intrathecal administration of baclofen. Because of the possibility of potentially life-threatening CNS depression, cardiovascular collapse, and/or respiratory failure, physicians must be adequately trained and educated in chronic intrathecal infusion therapy. The pump system should not be implanted until the patient’s response to bolus LIORESAL INTRATHECAL injection is adequately evaluated. 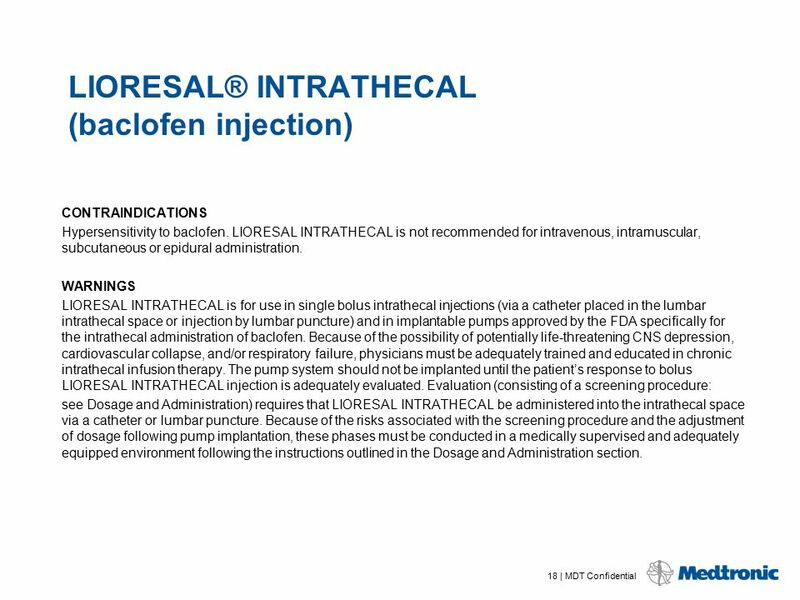 Evaluation (consisting of a screening procedure: see Dosage and Administration) requires that LIORESAL INTRATHECAL be administered into the intrathecal space via a catheter or lumbar puncture. Because of the risks associated with the screening procedure and the adjustment of dosage following pump implantation, these phases must be conducted in a medically supervised and adequately equipped environment following the instructions outlined in the Dosage and Administration section. Overdose: Signs of overdose may appear suddenly or insidiously. Acute massive overdose may present as coma. Less sudden and/or less severe forms of overdose may present with signs of drowsiness, lightheadedness, dizziness, somnolence, respiratory depression, seizures, rostral progression of hypotonia and loss of consciousness progressing to coma. Should overdose appear likely, the patient should be taken immediately to a hospital for assessment and emptying of the pump reservoir. In cases reported to date, overdose has generally been related to pump malfunction, inadvertent subcutaneous injection, or dosing error. (See Drug Overdose Symptoms and Treatment.) Extreme caution must be used when filling an FDA approved implantable pump. Such pumps should only be refilled through the reservoir refill septum. Inadvertent injection into the subcutaneous tissue can occur if the reservoir refill septum is not properly accessed. Some pumps are also equipped with a catheter access port that allows direct access to the intrathecal catheter. Direct injection into this catheter access port or inadvertent injection into the subcutaneous tissue may cause a life-threatening overdose. Resuscitative equipment should be available. Following surgical implantation of the pump, particularly during the initial phases of pump use, the patient should be monitored closely until it is certain that the patient’s response to the infusion is acceptable and reasonably stable. 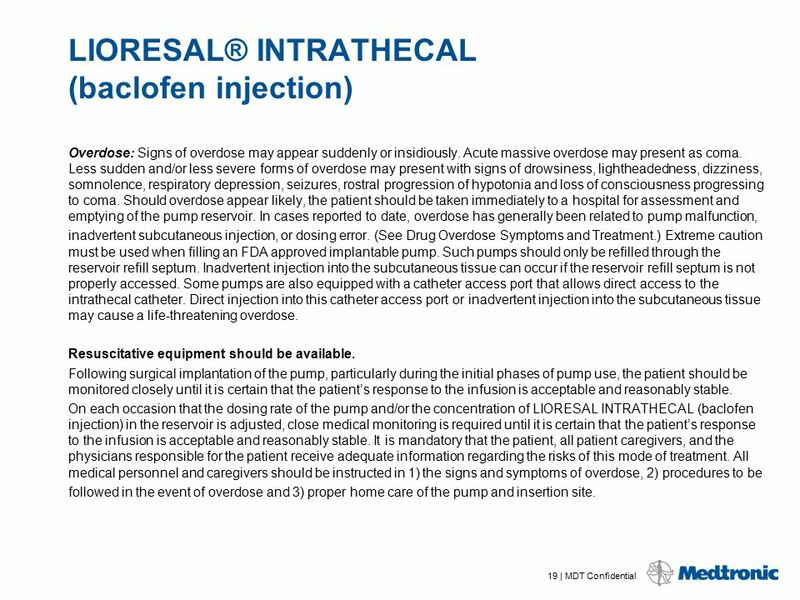 On each occasion that the dosing rate of the pump and/or the concentration of LIORESAL INTRATHECAL (baclofen injection) in the reservoir is adjusted, close medical monitoring is required until it is certain that the patient’s response to the infusion is acceptable and reasonably stable. It is mandatory that the patient, all patient caregivers, and the physicians responsible for the patient receive adequate information regarding the risks of this mode of treatment. All medical personnel and caregivers should be instructed in 1) the signs and symptoms of overdose, 2) procedures to be followed in the event of overdose and 3) proper home care of the pump and insertion site. Withdrawal: Abrupt withdrawal of intrathecal baclofen, regardless of the cause, has resulted in sequelae that included high fever, altered mental status, exaggerated rebound spasticity and muscle rigidity, that in rare cases progressed to rhabdomyolysis, multiple organ-system failure, and death. In the first 9 years of post-marketing experience, 27 cases of withdrawal temporally related to the cessation of baclofen therapy were reported; six patients died. In most cases, symptoms of withdrawal appeared within hours to a few days following interruption of baclofen therapy. Common reasons for abrupt interruption of intrathecal baclofen therapy included malfunction of the catheter (especially disconnection), low volume in the pump reservoir, and end of pump battery life; human error may have played a causal or contributing role in some cases. Cases of intrathecal mass at the tip of the implanted catheter leading to withdrawal symptoms have also been reported, most of them involving pharmacy compounded analgesic admixtures (see PRECAUTIONS). Prevention of abrupt discontinuation of intrathecal baclofen requires careful attention to programming and monitoring of the infusion system, refill scheduling and procedures, and pump alarms. 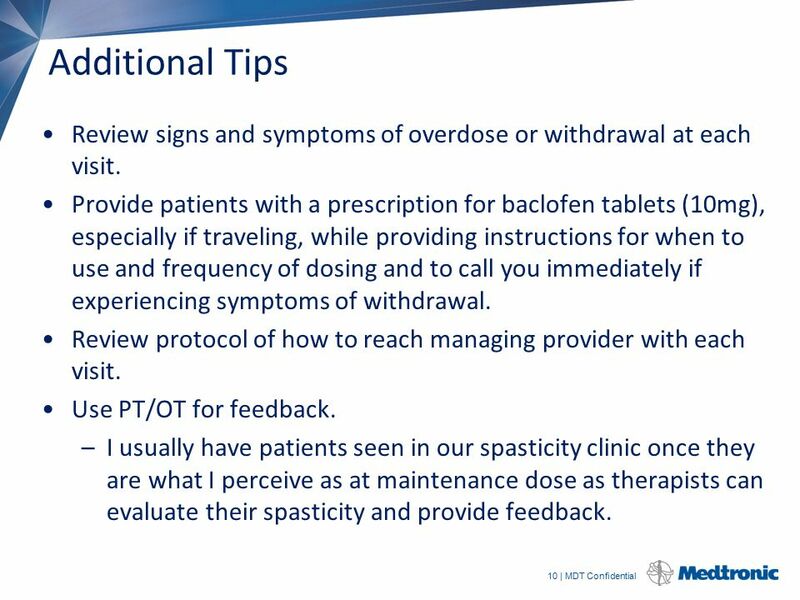 Patients and caregivers should be advised of the importance of keeping scheduled refill visits and should be educated on the early symptoms of baclofen withdrawal. All patients receiving intrathecal baclofen therapy are potentially at risk for withdrawal. Early symptoms of baclofen withdrawal may include return of baseline spasticity, pruritus, hypotension, and paresthesias. Some clinical characteristics of the advanced intrathecal baclofen withdrawal syndrome may resemble autonomic dysreflexia, infection (sepsis), malignant hyperthermia, neuroleptic-malignant syndrome, or other conditions associated with a hypermetabolic state or widespread rhabdomyolysis. Rapid, accurate diagnosis and treatment in an emergency-room or intensive-care setting are important in order to prevent the potentially life-threatening central nervous system and systemic effects of intrathecal baclofen withdrawal. 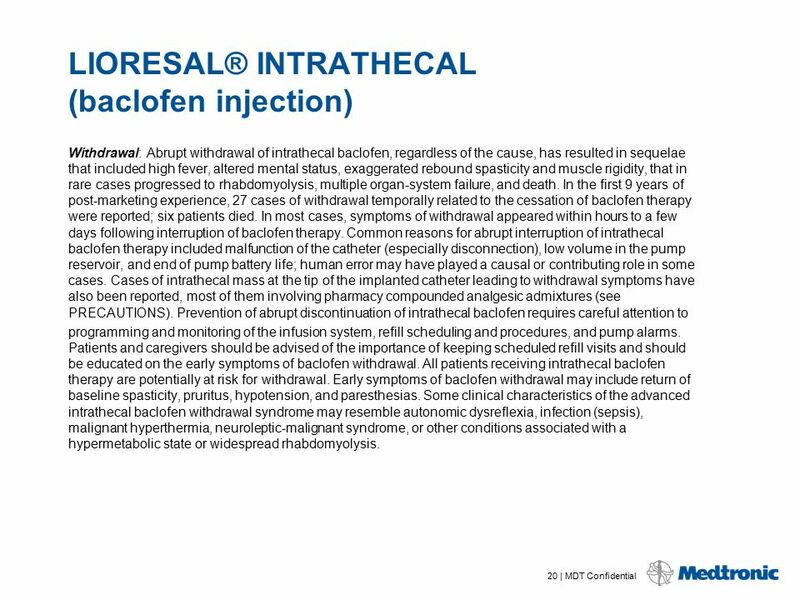 The suggested treatment for intrathecal baclofen withdrawal is the restoration of intrathecal baclofen at or near the same dosage as before therapy was interrupted. However, if restoration of intrathecal delivery is delayed, treatment with GABA-ergic agonist drugs such as oral or enteral baclofen, or oral, enteral, or intravenous benzodiazepines may prevent potentially fatal sequelae. Oral or enteral baclofen alone should not be relied upon to halt the progression of intrathecal baclofen withdrawal. Seizures have been reported during overdose and with withdrawal from LIORESAL INTRATHECAL as well as in patients maintained on therapeutic doses of LIORESAL INTRATHECAL. Fatalities: Spasticity of Spinal Cord Origin: There were 16 deaths reported among the 576 U.S. patients treated with LIORESAL INTRATHECAL (baclofen injection) in pre- and post-marketing studies evaluated as of December Because these patients were treated under uncontrolled clinical settings, it is impossible to determine definitively what role, if any, LIORESAL INTRATHECAL played in their deaths. As a group, the patients who died were relatively young (mean age was 47 with a range from 25 to 63), but the majority suffered from severe spasticity of many years duration, were nonambulatory, had various medical complications such as pneumonia, urinary tract infections, and decubiti, and/or had received multiple concomitant medications. A case-by-case review of the clinical course of the 16 patients who died failed to reveal any unique signs, symptoms, or laboratory results that would suggest that treatment with LIORESAL INTRATHECAL caused their deaths. Two patients, however, did suffer sudden and unexpected death within 2 weeks of pump implantation and one patient died unexpectedly after screening. One patient, a 44 year-old male with MS, died in the hospital on the second day following pump implantation. An autopsy demonstrated severe fibrosis of the coronary conduction system. A second patient, a 52 year-old woman with MS and a history of an inferior wall myocardial infarction, was found dead in bed 12 days after pump implantation, 2 hours after having had documented normal vital signs. An autopsy revealed pulmonary congestion and bilateral pleural effusions. It is impossible to determine whether LIORESAL INTRATHECAL contributed to these deaths. The third patient underwent three baclofen screening trials. His medical history included SCI, aspiration pneumonia, septic shock, disseminated intravascular coagulopathy, severe metabolic acidosis, hepatic toxicity, and status epilepticus. Twelve days after screening (he was not implanted), he again experienced status epilepticus with subsequent significant neurological deterioration. Based upon prior instruction, extraordinary resuscitative measures were not pursued and the patient died. Spasticity of Cerebral Origin: There were three deaths occurring among the 211 patients treated with LIORESAL INTRATHECAL in pre-marketing studies as of March These deaths were not attributed to the therapy. PRECAUTIONS Children should be of sufficient body mass to accommodate the implantable pump for chronic infusion. Please consult pump manufacturer's manual for specific recommendations. Safety and effectiveness in pediatric patients below the age of 4 have not been established. Screening Patients should be infection-free prior to the screening trial with LIORESAL INTRATHECAL (baclofen injection) because the presence of a systemic infection may interfere with an assessment of the patient’s response to bolus LIORESAL INTRATHECAL. Pump Implantation Patients should be infection-free prior to pump implantation because the presence of infection may increase the risk of surgical complications. Moreover, a systemic infection may complicate dosing. Pump Dose Adjustment and Titration In most patients, it will be necessary to increase the dose gradually over time to maintain effectiveness; a sudden requirement for substantial dose escalation typically indicates a catheter complication (i.e., catheter kink or dislodgement). Reservoir refilling must be performed by fully trained and qualified personnel following the directions provided by the pump manufacturer. Inadvertent injection into the subcutaneous tissue can occur if the reservoir refill septum is not properly accessed. Subcutaneous injection may result in symptoms of a systemic overdose or early depletion of the reservoir. Refill intervals should be carefully calculated to prevent depletion of the reservoir, as this would result in the return of severe spasticity and possibly symptoms of withdrawal. Strict aseptic technique in filling is required to avoid bacterial contamination and serious infection. A period of observation appropriate to the clinical situation should follow each refill or manipulation of the drug reservoir. Extreme caution must be used when filling an FDA approved implantable pump equipped with an injection port that allows direct access to the intrathecal catheter. Direct injection into the catheter through the catheter access port may cause a life-threatening overdose. Additional considerations pertaining to dosage adjustment: It may be important to titrate the dose to maintain some degree of muscle tone and allow occasional spasms to: 1) help support circula ory function, 2) possibly prevent the formation of deep vein thrombosis, 3) optimize activities of daily living and ease of care. 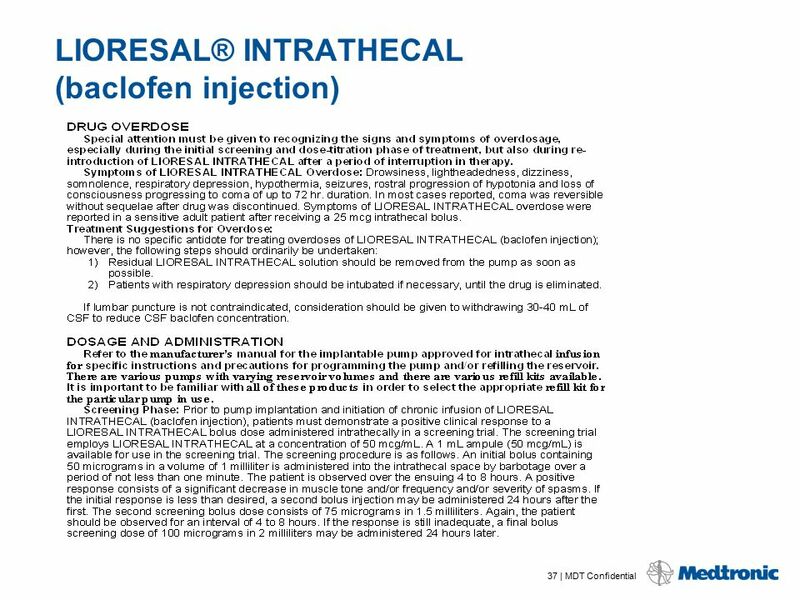 Except in overdose related emergencies, the dose of LIORESAL INTRATHECAL should ordinarily be reduced slowly if the drug is discontinued for any reason. An attempt should be made to discontinue concomitant oral antispasticity medication to avoid possible overdose or adverse drug interactions, either prior to screening or following implant and initiation of chronic LIORESAL INTRATHECAL infusion. Reduction and discontinuation of oral antispasmotics should be done slowly and with careful monitoring by the physician. Abrupt reduction or discontinuation of concomitant antispastics should be avoided. Drowsiness: Drowsiness has been reported in patients on LIORESAL INTRATHECAL. Patients should be cautioned regarding the operation of automobiles or other dangerous machinery, and activities made hazardous by decreased alertness. 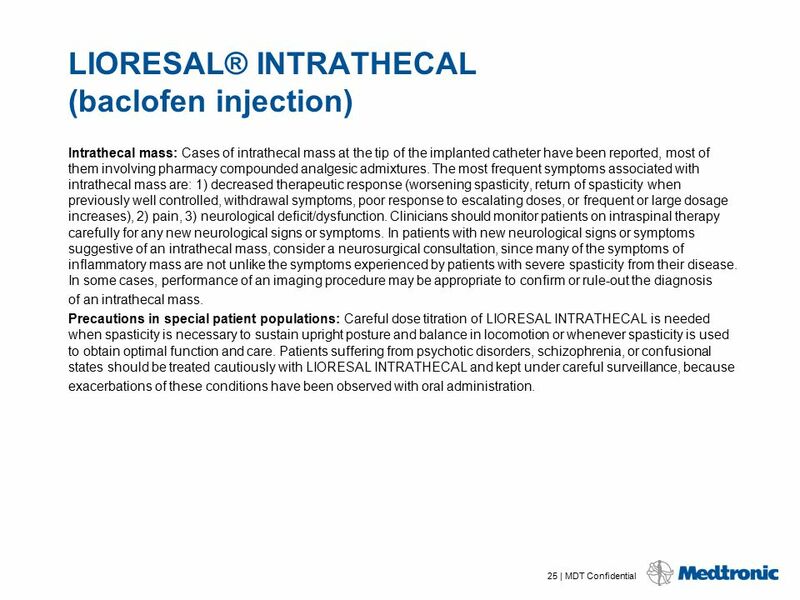 Patients should also be cautioned that the central nervous system depressant effects of LIORESAL INTRATHECAL (baclofen injection) may be additive to those of alcohol and other CNS depressants. Intrathecal mass: Cases of intrathecal mass at the tip of the implanted catheter have been reported, most of them involving pharmacy compounded analgesic admixtures. The most frequent symptoms associated with intrathecal mass are: 1) decreased therapeutic response (worsening spasticity, return of spasticity when previously well controlled, withdrawal symptoms, poor response to escalating doses, or frequent or large dosage increases), 2) pain, 3) neurological deficit/dysfunction. Clinicians should monitor patients on intraspinal therapy carefully for any new neurological signs or symptoms. In patients with new neurological signs or symptoms suggestive of an intrathecal mass, consider a neurosurgical consultation, since many of the symptoms of inflammatory mass are not unlike the symptoms experienced by patients with severe spasticity from their disease. In some cases, performance of an imaging procedure may be appropriate to confirm or rule-out the diagnosis of an intrathecal mass. Precautions in special patient populations: Careful dose titration of LIORESAL INTRATHECAL is needed when spasticity is necessary to sustain upright posture and balance in locomotion or whenever spasticity is used to obtain optimal function and care. Patients suffering from psychotic disorders, schizophrenia, or confusional states should be treated cautiously with LIORESAL INTRATHECAL and kept under careful surveillance, because exacerbations of these conditions have been observed with oral administration. LIORESAL INTRATHECAL should be used with caution in patients with a history of autonomic dysreflexia. The presence of nociceptive stimuli or abrupt withdrawal of LIORESAL INTRATHECAL (baclofen injection) may cause an autonomic dysreflexic episode. Because LIORESAL is primarily excreted unchanged by the kidneys, it should be given with caution in patients with impaired renal function and it may be necessary to reduce the dosage. LABORATORY TESTS No specific laboratory tests are deemed essential for the management of patients on LIORESAL INTRATHECAL. DRUG INTERACTIONS There is inadequate systematic experience with the use of LIORESAL INTRATHECAL in combination with other medications to predict specific drug-drug interactions. Interactions attributed to the combined use of LIORESAL INTRATHECAL and epidural morphine include hypotension and dyspnea. CARCINOGENESIS, MUTAGENESIS, AND IMPAIRMENT OF FERTILITY No increase in tumors was seen in rats receiving LIORESAL (baclofen USP) orally for two years at approximately times on a mg/kg basis, or times on a mg/m2 basis, the maximum oral dose recommended for human use. Mutagenicity assays with LIORESAL have not been performed. PREGNANCY CATEGORY C LIORESAL (baclofen USP) given orally has been shown to increase the incidence of omphaloceles (ventral hernias) in fetuses of rats given approximately 13 times on a mg/kg basis, or 3 times on a mg/m2 basis, the maximum oral dose recommended for human use; this dose also caused reductions in food intake and weight gain in the dams. This abnormality was not seen in mice or rabbits. There are no adequate and well-controlled studies in pregnant women. LIORESAL should be used during pregnancy only if the potential benefit justifies the potential risk to the fetus. NURSING MOTHERS In mothers treated with oral LIORESAL (baclofen USP) in therapeutic doses, the active substance passes into the breast milk. It is not known whether detectable levels of drug are present in breast milk of nursing mothers receiving LIORESAL INTRATHECAL. As a general rule, nursing should be undertaken while a patient is receiving LIORESAL INTRATHECAL only if the potential benefit justifies the potential risks to the infant. PEDIATRIC USE Children should be of sufficient body mass to accommodate the implantable pump for chronic infusion. Please consult pump manufacturer's manual for specific recommendations. Safety and effectiveness in pediatric patients below the age of 4 have not been established. Considerations based on experience with oral LIORESAL (baclofen USP) A dose-related increase in incidence of ovarian cysts was observed in female rats treated chronically with oral LIORESAL. Ovarian cysts have been found by palpation in about 4% of the multiple sclerosis patients who were treated with oral LIORESAL for up to one year. In most cases these cysts disappeared spontaneously while patients continued to receive the drug. Ovarian cysts are estimated to occur spontaneously in approximately 1% to 5% of the normal female population. ADVERSE DRUG EVENTS Spasticity of Spinal Cord Origin: Commonly Observed in Patients with Spasticity of Spinal Origin — In pre- and post-marketing clinical trials, the most commonly observed adverse events associated with use of LIORESAL INTRATHECAL (baclofen injection) which were not seen at an equivalent incidence among placebotreated patients were: somnolence, dizziness, nausea, hypotension, headache, convulsions and hypotonia. 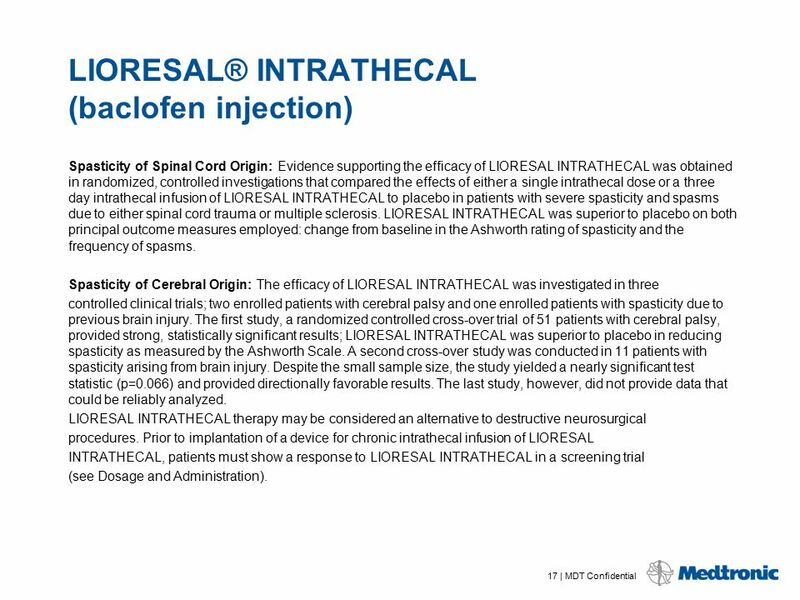 Associated with Discontinuation of Treatment — 8/474 patients with spasticity of spinal cord origin receiving long term infusion of LIORESAL INTRATHECAL in pre- and post-marketing clinical studies in the U.S. discontinued treatment due to adverse events. These include: pump pocket infections (3), meningitis (2), wound dehiscence (1), gynecological fibroids (1) and pump overpressurization (1) with unknown, if any, sequela. Eleven patients who developed coma secondary to overdose had their treatment temporarily suspended, but all were subsequently re-started and were not, therefore, considered to be true discontinuations. Fatalities — See Warnings. Incidence in Controlled Trials — Experience with LIORESAL INTRATHECAL (baclofen injection) obtained in parallel, placebo-controlled, randomized studies provides only a limited basis for estimating the incidence of adverse events because the studies were of very brief duration (up to three days of infusion) and involved only a total of 63 patients. The following events occurred among the 31 patients receiving LIORESAL INTRATHECAL (baclofen injection) in two randomized, placebocontrolled trials: hypotension (2), dizziness (2), headache (2), dyspnea (1). No adverse events were reported among the 32 patients receiving placebo in these studies. 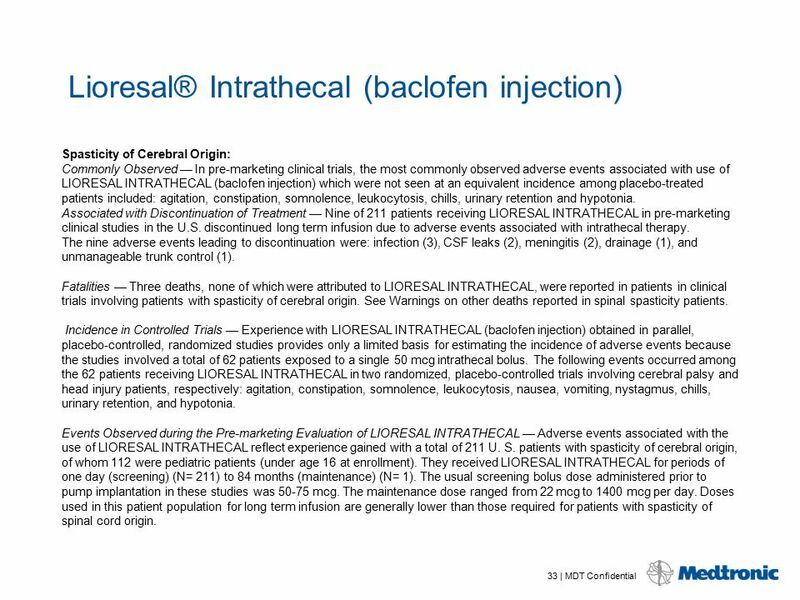 Events Observed during the Pre- and Post-marketing Evaluation of LIORESAL INTRATHECAL — Adverse events associated with the use of LIORESAL INTRATHECAL reflect experience gained with 576 patients followed prospectively in the United States. They received LIORESAL INTRATHECAL for periods of one day (screening) (N = 576) to over eight years (maintenance) (N = 10). The usual screening bolus dose administered prior to pump implantation in these studies was typically 50 mcg. The maintenance dose ranged from 12 mcg to 2003 mcg per day. Because of the open, uncontrolled nature of the experience, a causal linkage between events observed and the administration of LIORESAL INTRATHECAL cannot be reliably assessed in many cases and many of the adverse events reported are known to occur in association with the underlying conditions being treated. Nonetheless, many of the more commonly reported reactions—hypotonia, somnolence, dizziness, paresthesia, nausea/vomiting and headache—appear clearly drug-related. Adverse experiences reported during all U.S. studies (both controlled and uncontrolled) are shown in the following table. 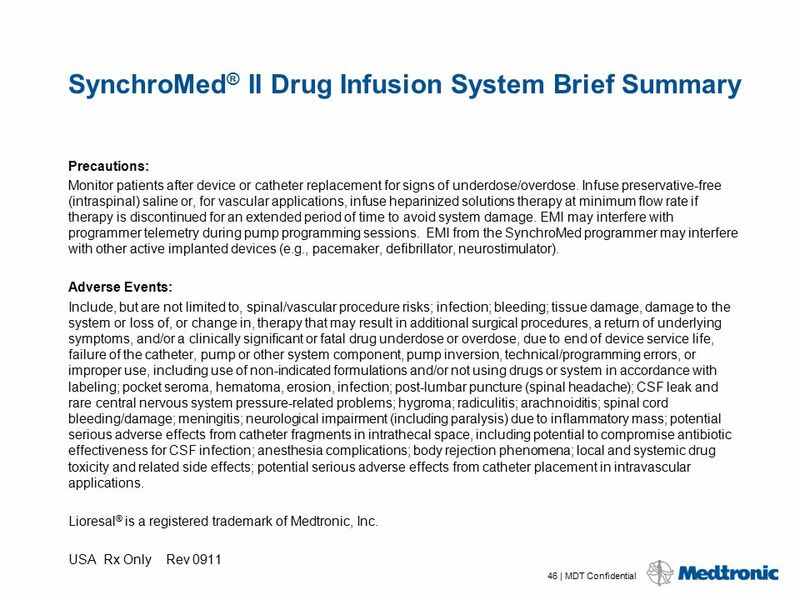 Eight of 474 patients who received chronic infusion via implanted pumps had adverse experiences which led to a discontinuation of long term treatment in the pre- and post-marketing studies. 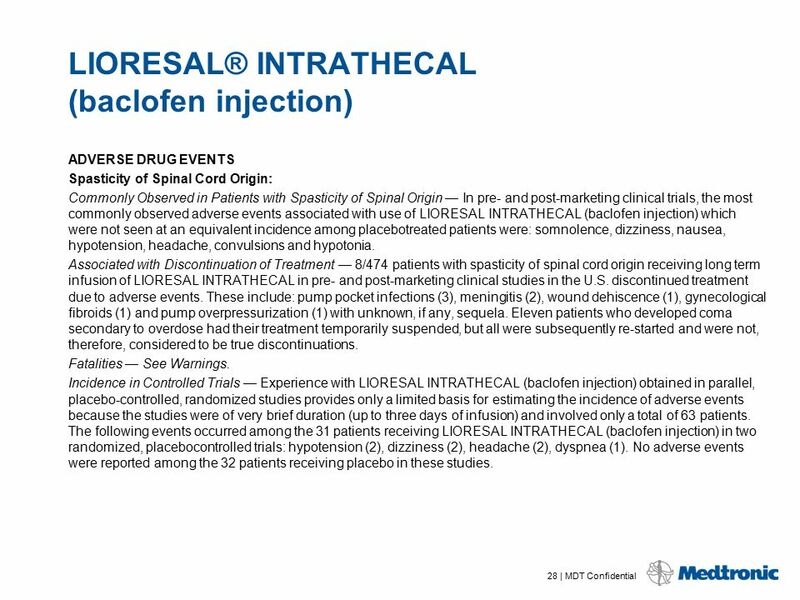 In addition to the more common (1% or more) adverse events reported in the prospectively followed 576 domestic patients in pre- and post-marketing studies, experience from an additional 194 patients exposed to LIORESAL INTRATHECAL (baclofen injection) from foreign studies has been reported. The following adverse events, not described in the table, and arranged in decreasing order of frequency, and classified by body system, were reported: Nervous System: Abnormal gait, thinking abnormal, tremor, amnesia, twitching, vasodilitation, cerebrovascular accident, nystagmus, personality disorder, psychotic depression, cerebral ischemia, emotional lability, euphoria, hypertonia, ileus, drug dependence, incoordination, paranoid reaction and ptosis. Digestive System: Flatulence, dysphagia, dyspepsia and gastroenteritis. Cardiovascular: Postural hypotension, bradycardia, palpitations, syncope, arrhythmia ventricular, deep thrombophlebitis, pallor and tachycardia. Respiratory: Respiratory disorder, aspiration pneumonia, hyperventilation, pulmonary embolus and rhinitis. Urogenital: Hematuria and kidney failure. Skin and Appendages: Alopecia and sweating. Metabolic and Nutritional Disorders: Weight loss, albuminuria, dehydration and hyperglycemia. Special Senses: Abnormal vision, abnormality of accommodation, photophobia, taste loss and tinnitus. Body as a Whole: Suicide, lack of drug effect, abdominal pain, hypothermia, neck rigidity, chest pain, chills, face edema, flu syndrome and overdose. Hemic and Lymphatic System: Anemia. Spasticity of Cerebral Origin: Commonly Observed — In pre-marketing clinical trials, the most commonly observed adverse events associated with use of LIORESAL INTRATHECAL (baclofen injection) which were not seen at an equivalent incidence among placebo-treated patients included: agitation, constipation, somnolence, leukocytosis, chills, urinary retention and hypotonia. 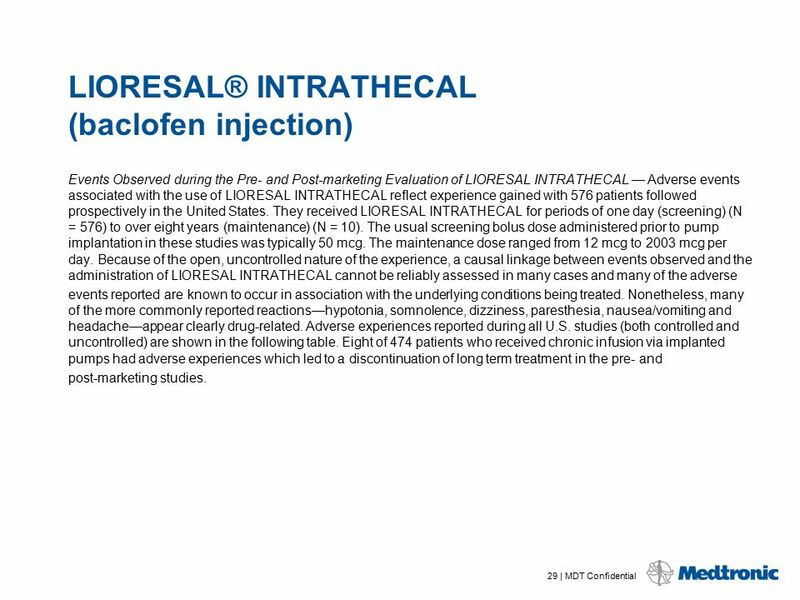 Associated with Discontinuation of Treatment — Nine of 211 patients receiving LIORESAL INTRATHECAL in pre-marketing clinical studies in the U.S. discontinued long term infusion due to adverse events associated with intrathecal therapy. The nine adverse events leading to discontinuation were: infection (3), CSF leaks (2), meningitis (2), drainage (1), and unmanageable trunk control (1). Fatalities — Three deaths, none of which were attributed to LIORESAL INTRATHECAL, were reported in patients in clinical trials involving patients with spasticity of cerebral origin. See Warnings on other deaths reported in spinal spasticity patients. Incidence in Controlled Trials — Experience with LIORESAL INTRATHECAL (baclofen injection) obtained in parallel, placebo-controlled, randomized studies provides only a limited basis for estimating the incidence of adverse events because the studies involved a total of 62 patients exposed to a single 50 mcg intrathecal bolus. The following events occurred among the 62 patients receiving LIORESAL INTRATHECAL in two randomized, placebo-controlled trials involving cerebral palsy and head injury patients, respectively: agitation, constipation, somnolence, leukocytosis, nausea, vomiting, nystagmus, chills, urinary retention, and hypotonia. Events Observed during the Pre-marketing Evaluation of LIORESAL INTRATHECAL — Adverse events associated with the use of LIORESAL INTRATHECAL reflect experience gained with a total of 211 U. S. patients with spasticity of cerebral origin, of whom 112 were pediatric patients (under age 16 at enrollment). They received LIORESAL INTRATHECAL for periods of one day (screening) (N= 211) to 84 months (maintenance) (N= 1). The usual screening bolus dose administered prior to pump implantation in these studies was mcg. The maintenance dose ranged from 22 mcg to 1400 mcg per day. Doses used in this patient population for long term infusion are generally lower than those required for patients with spasticity of spinal cord origin. Pediatric Patients: The starting screening dose for pediatric patients is the same as in adult patients, i.e., 50 mcg. However, for very small patients, a screening dose of 25 mcg may be tried first. Patients who do not respond to a 100 mcg intrathecal bolus should not be considered candidates for an implanted pump for chronic infusion. Post-Implant Dose Titration Period: To determine the initial total daily dose of LIORESAL INTRATHECAL following implant, the screening dose that gave a positive effect should be doubled and administered over a 24-hour period, unless the efficacy of the bolus dose was maintained for more than 8 hours, in which case the starting daily dose should be the screening dose delivered over a 24-hour period. No dose increases should be given in the first 24 hours (i.e., until the steady state is achieved). Adult Patients with Spasticity of Spinal Cord Origin: After the first 24 hours, for adult patients, the daily dosage should be increased slowly by 10-30% increments and only once every 24 hours, until the desired clinical effect is achieved. Adult Patients with Spasticity of Cerebral Origin: After the first 24 hours, the daily dose should be increased slowly by 5-15% only once every 24 hours, until the desired clinical effect is achieved. Pediatric Patients: After the first 24 hours, the daily dose should be increased slowly by 5-15% only once every 24 hours, until the desired clinical effect is achieved. If there is not a substantive clinical response to increases in the daily dose, check for proper pump function and catheter patency. Patients must be monitored closely in a fully equipped and staffed environment during the screening phase and dose-titration period immediately following implant. Resuscitative equipment should be immediately available for use in case of life-threatening or intolerable side effects. Maintenance Therapy: Spasticity of Spinal Cord Origin Patients: The clinical goal is to maintain muscle tone as close to normal as possible, and to minimize the frequency and severity of spasms to the extent possible, without inducing intolerable side effects. Very often, the maintenance dose needs to be adjusted during the first few months of therapy while patients adjust to changes in life style due to the alleviation of spasticity. During periodic refills of the pump, the daily dose may be increased by 10-40%, but no more than 40%, to maintain adequate symptom control. The daily dose may be reduced by 10-20% if patients experience side effects. Most patients require gradual increases in dose over time to maintain optimal response during chronic therapy. A sudden large requirement for dose escalation suggests a catheter complication (i.e., catheter kink or dislodgement). 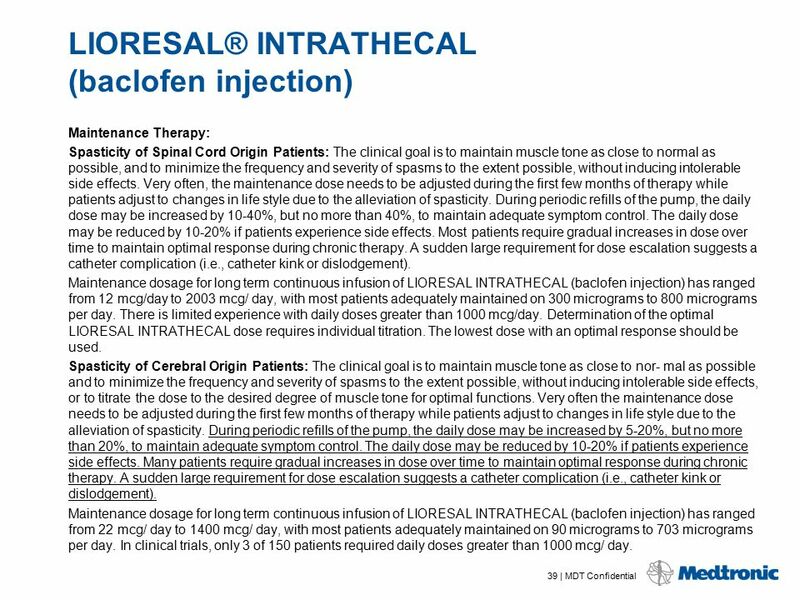 Maintenance dosage for long term continuous infusion of LIORESAL INTRATHECAL (baclofen injection) has ranged from 12 mcg/day to 2003 mcg/ day, with most patients adequately maintained on 300 micrograms to 800 micrograms per day. There is limited experience with daily doses greater than 1000 mcg/day. Determination of the optimal LIORESAL INTRATHECAL dose requires individual titration. The lowest dose with an optimal response should be used. Spasticity of Cerebral Origin Patients: The clinical goal is to maintain muscle tone as close to nor- mal as possible and to minimize the frequency and severity of spasms to the extent possible, without inducing intolerable side effects, or to titrate the dose to the desired degree of muscle tone for optimal functions. 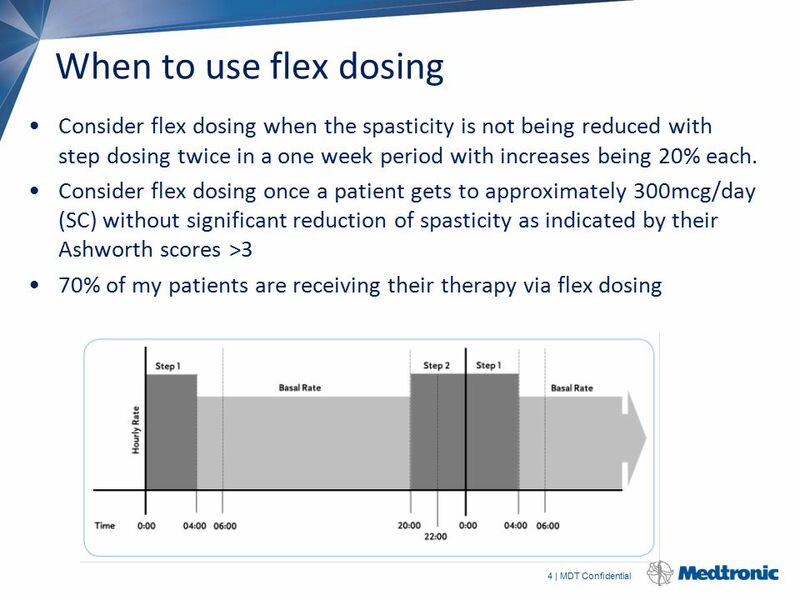 Very often the maintenance dose needs to be adjusted during the first few months of therapy while patients adjust to changes in life style due to the alleviation of spasticity. During periodic refills of the pump, the daily dose may be increased by 5-20%, but no more than 20%, to maintain adequate symptom control. The daily dose may be reduced by 10-20% if patients experience side effects. Many patients require gradual increases in dose over time to maintain optimal response during chronic therapy. A sudden large requirement for dose escalation suggests a catheter complication (i.e., catheter kink or dislodgement). 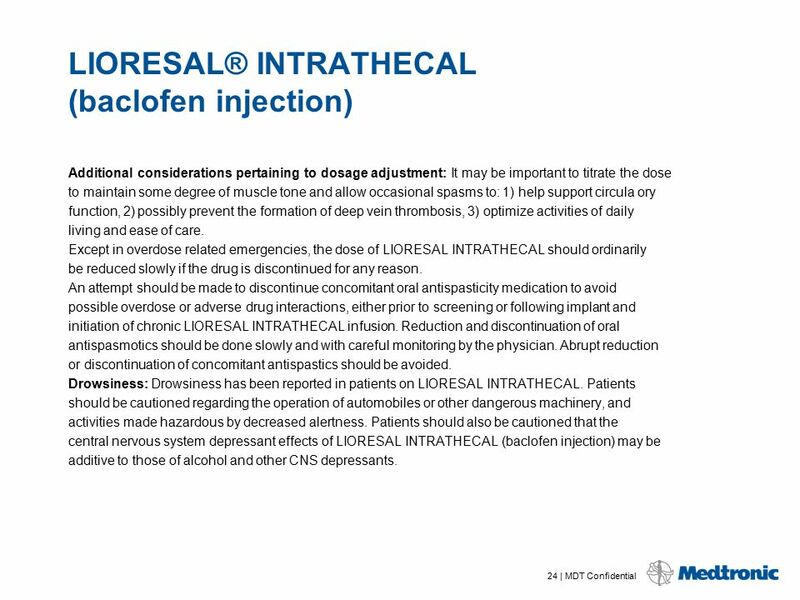 Maintenance dosage for long term continuous infusion of LIORESAL INTRATHECAL (baclofen injection) has ranged from 22 mcg/ day to 1400 mcg/ day, with most patients adequately maintained on 90 micrograms to 703 micrograms per day. In clinical trials, only 3 of 150 patients required daily doses greater than 1000 mcg/ day. Pediatric Patients: Use same dosing recommendations for patients with spasticity of cerebral origin. Pediatric patients under 12 years seemed to require a lower daily dose in clinical trials. Average daily dose for patients under 12 years was 274 mcg/ day, with a range of 24 to 1199 mcg/ day. Dosage requirement for pediatric patients over 12 years does not seem to be different from that of adult patients. Determination of the optimal LIORESAL INTRATHECAL dose requires individual titration. The lowest dose with an optimal response should be used. Potential need for dose adjustments in chronic use: During long term treatment, approximately 5% (28/627) of patients become refractory to increasing doses. There is not sufficient experience to make firm recommendations for tolerance treatment; however, this “tolerance” has been treated on occasion, in hospital, by a “drug holiday” consisting of the gradual reduction of LIORESAL INTRATHECAL over a 2 to 4 week period and switching to alternative methods of spasticity management. 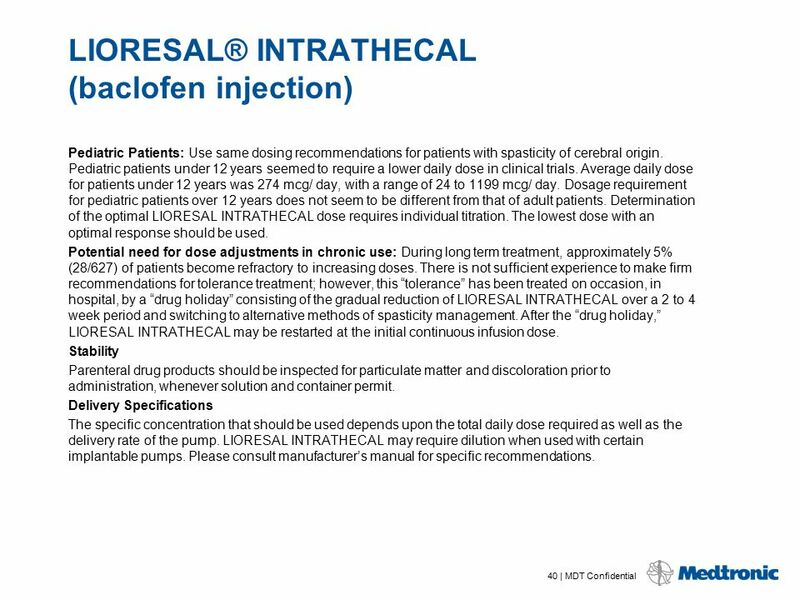 After the “drug holiday,” LIORESAL INTRATHECAL may be restarted at the initial continuous infusion dose. Stability Parenteral drug products should be inspected for particulate matter and discoloration prior to administration, whenever solution and container permit. Delivery Specifications The specific concentration that should be used depends upon the total daily dose required as well as the delivery rate of the pump. LIORESAL INTRATHECAL may require dilution when used with certain implantable pumps. Please consult manufacturer’s manual for specific recommendations. Preparation Instruction: Screening Use the 1 mL screening ampule only (50 mcg/mL) for bolus injection into the subarachnoid space. For a 50 mcg bolus dose, use 1 mL of the screening ampule. Use 1.5 mL of 50 mcg/mL baclofen injection for a 75 mcg bolus dose. For the maximum screening dose of 100 mcg, use 2 mL of 50 mcg/mL baclofen injection (2 screening ampules). 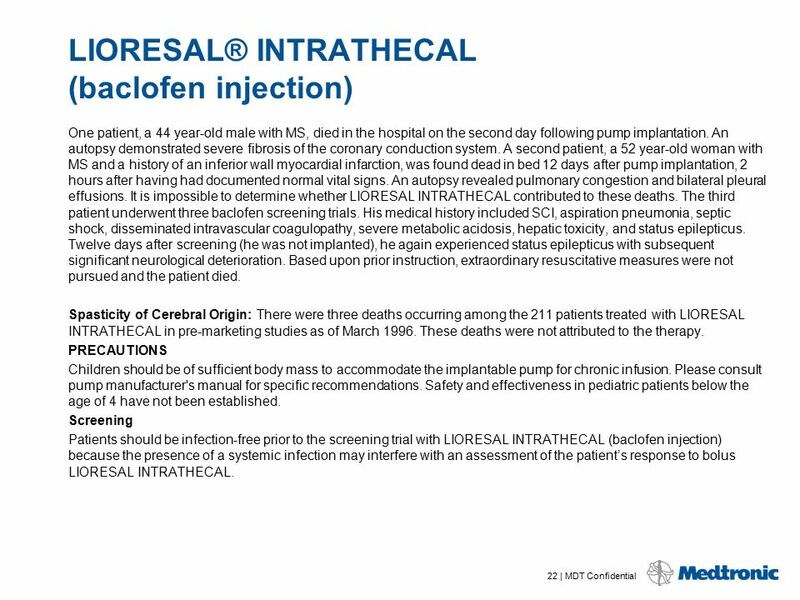 Maintenance For patients who require concentrations other than 500 mcg/mL or 2000 mcg/mL, LIORESAL INTRATHECAL must be diluted. 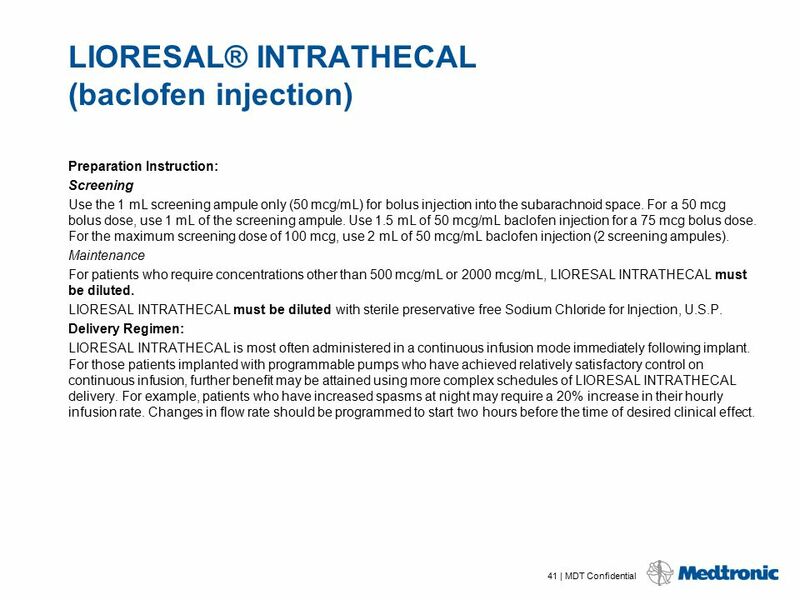 LIORESAL INTRATHECAL must be diluted with sterile preservative free Sodium Chloride for Injection, U.S.P. 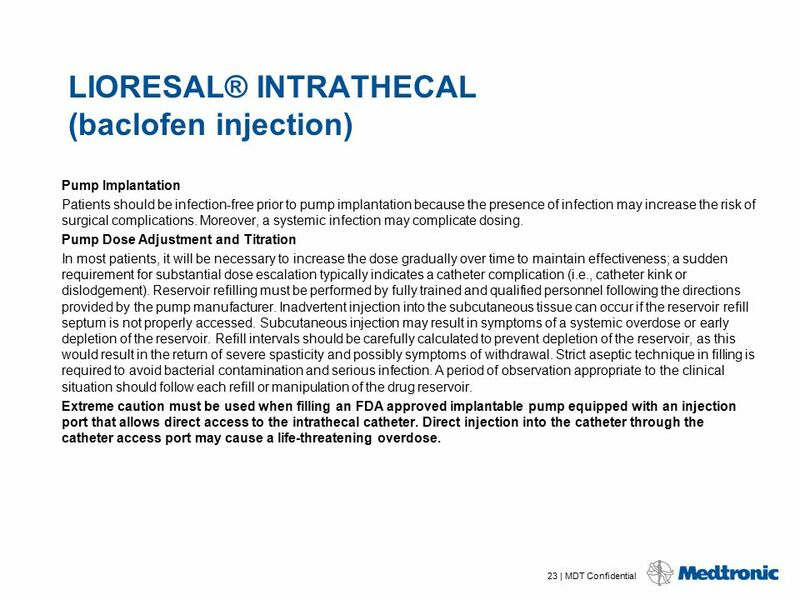 Delivery Regimen: LIORESAL INTRATHECAL is most often administered in a continuous infusion mode immediately following implant. For those patients implanted with programmable pumps who have achieved relatively satisfactory control on continuous infusion, further benefit may be attained using more complex schedules of LIORESAL INTRATHECAL delivery. For example, patients who have increased spasms at night may require a 20% increase in their hourly infusion rate. Changes in flow rate should be programmed to start two hours before the time of desired clinical effect. 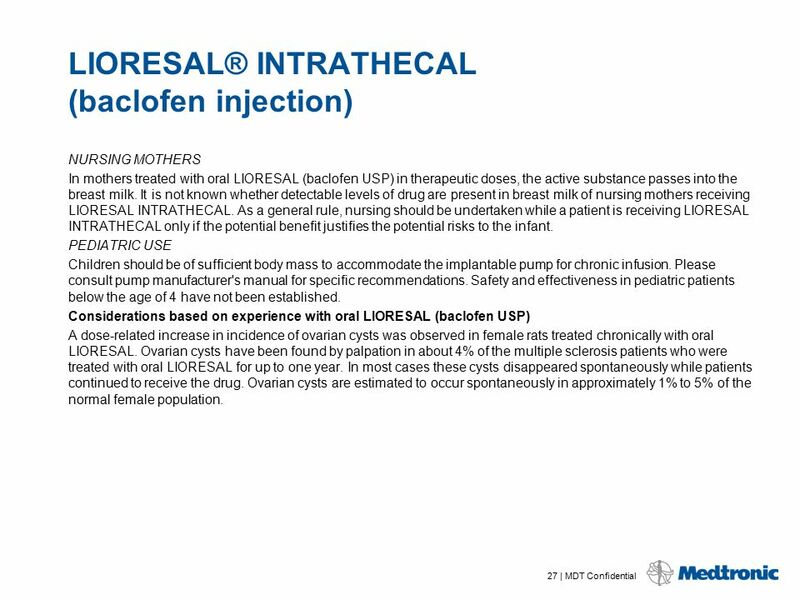 HOW SUPPLIED LIORESAL INTRATHECAL (baclofen injection) is available in single use ampules of 10 mg/20 mL (500 mcg/mL) or 10 mg/5 mL (2000 mcg/mL) or 40 mg/20 mL (2000 mcg/mL) packaged in a Refill Kit for intrathecal administration. 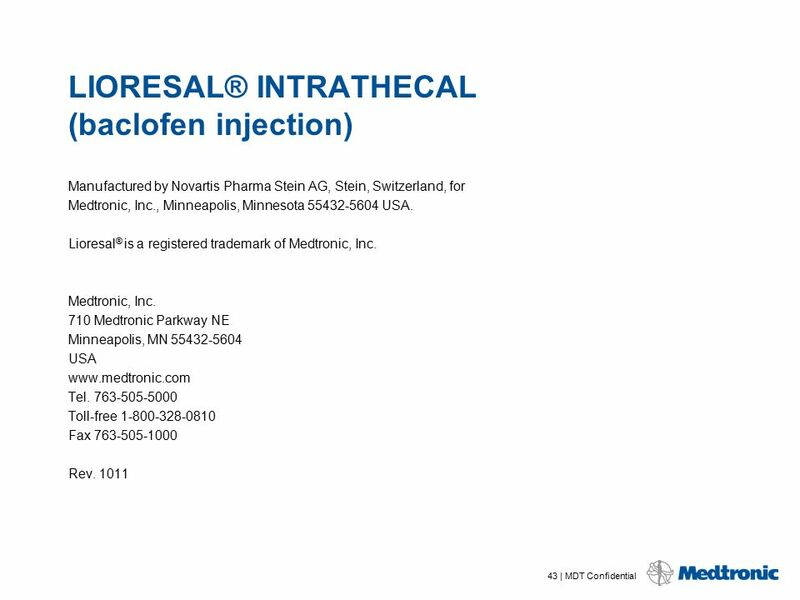 For screening, LIORESAL INTRATHECAL is available in a single use ampule of 0.05 mg/1 mL. Model 8561 LIORESAL INTRATHECAL Refill Kit contains one ampule of 10 mg/20 mL (500 mcg/mL) (NDC ). Model 8562 LIORESAL INTRATHECAL Refill Kit contains two ampules of 10 mg/5 mL (2000 mcg/mL) (NDC ). Model 8563s LIORESAL INTRATHECAL contains one ampule of 0.05 mg/1 mL (NDC ). Model 8564 LIORESAL INTRATHECAL Refill Kit contains four ampules of 10 mg/5 mL (2000 mcg/mL) (NDC ) or one ampule of 40 mg/20 mL (2000 mcg/mL) (NDC ). Model 8565 LIORESAL INTRATHECAL Refill Kit contains two ampules of 10 mg/20 mL (500 mcg/mL) (NDC ). 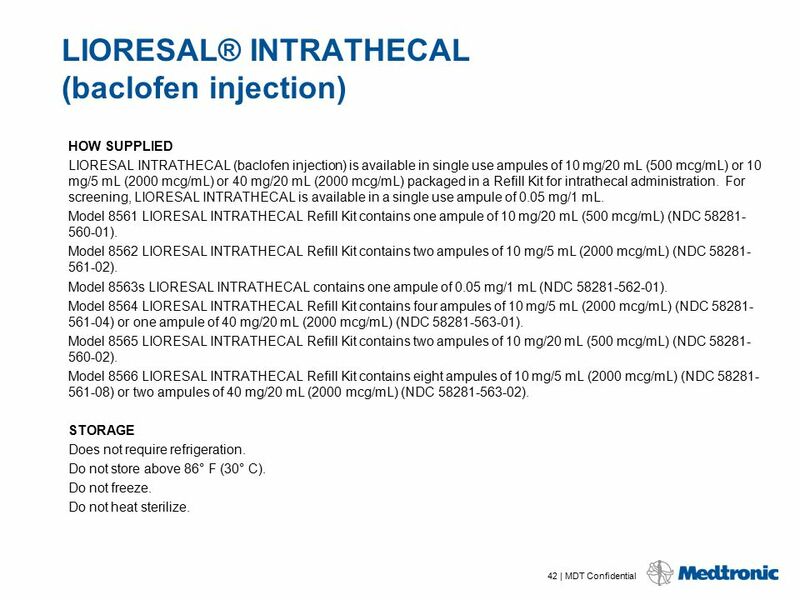 Model 8566 LIORESAL INTRATHECAL Refill Kit contains eight ampules of 10 mg/5 mL (2000 mcg/mL) (NDC ) or two ampules of 40 mg/20 mL (2000 mcg/mL) (NDC ). STORAGE Does not require refrigeration. Do not store above 86° F (30° C). Do not freeze. Do not heat sterilize. Product technical manuals and the appropriate drug labeling must be reviewed prior to use for detailed disclosure. Indications: US: Chronic intraspinal (epidural and intrathecal) infusion of preservative-free morphine sulfate sterile solution in the treatment of chronic intractable pain, chronic intrathecal infusion of preservative-free ziconotide sterile solution for the management of severe chronic pain, and chronic intrathecal infusion of Lioresal® Intrathecal (baclofen injection) for the management of severe spasticity; chronic intravascular infusion of floxuridine (FUDR) or methotrexate for the treatment of primary or metastatic cancer. Outside of US: Chronic infusion of drugs or fluids tested as compatible and listed in the product labeling. Contraindications: Infection; implant depth greater than 2.5 cm below skin; insufficient body size; spinal anomalies; drugs with preservatives, drug contraindications, drug formulations with pH ≤3, use of catheter access port (CAP) kit for refills or of refill kit for catheter access, blood sampling through CAP in vascular applications, use of Personal Therapy Manager to administer opioid to opioid-naïve patients or to administer ziconotide. Warnings: Non-indicated formulations may contain neurotoxic preservatives, antimicrobials, or antioxidants, or may be incompatible with and damage the system. 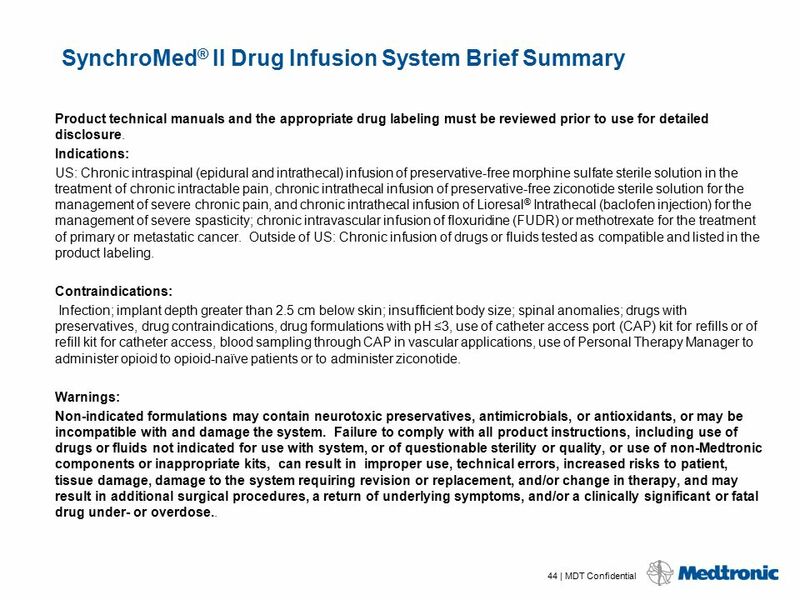 Failure to comply with all product instructions, including use of drugs or fluids not indicated for use with system, or of questionable sterility or quality, or use of non-Medtronic components or inappropriate kits, can result in improper use, technical errors, increased risks to patient, tissue damage, damage to the system requiring revision or replacement, and/or change in therapy, and may result in additional surgical procedures, a return of underlying symptoms, and/or a clinically significant or fatal drug under- or overdose.. Refer to appropriate drug labeling for indications, contraindications, warnings, precautions, dosage and administration information, screening procedures and underdose and overdose symptoms and methods of management. Physicians must be familiar with the drug stability information in the product technical manuals and must understand the dose relationship to drug concentration and pump flow rate before prescribing pump infusion. Implantation and ongoing system management must be performed by individuals trained in the operation and handling of the infusion system. An inflammatory mass that can result in serious neurological impairment, including paralysis, may occur at the tip of the implanted catheter. Clinicians should monitor patients on intraspinal therapy carefully for any new neurological signs or symptoms, change in underlying symptoms, or need for rapid dose escalation. Inform patients of the signs and symptoms of drug under- or overdose, appropriate drug warnings and precautions regarding drug interactions, potential side effects, and signs and symptoms that require medical attention, including prodromal signs and symptoms of inflammatory mass. Failure to recognize signs and symptoms and seek appropriate medical intervention can result in serious injury or death. Instruct patients to notify their healthcare professionals of the implanted pump before medical tests/procedures, to return for refills at prescribed times, to carry their Medtronic device identification card, to avoid manipulating the pump through the skin, to consult with their clinician if the pump alarms and before traveling or engaging in activities that can stress the infusion system or involve pressure or temperature changes. Strong sources of electromagnetic interference (EMI), such as short wave (RF) diathermy and MRI, can negatively interact with the pump and cause heating of the implanted pump, system damage, or changes in pump operation or flow rate, that can result in patient injury from tissue heating, additional surgical procedures, a return of underlying symptoms, and/or a clinically significant or fatal drug underdose or overdose. Avoid using shortwave (RF) diathermy within 30 cm of the pump or catheter. Effects of other types of diathermy (microwave, ultrasonic, etc.) on the pump are unknown. 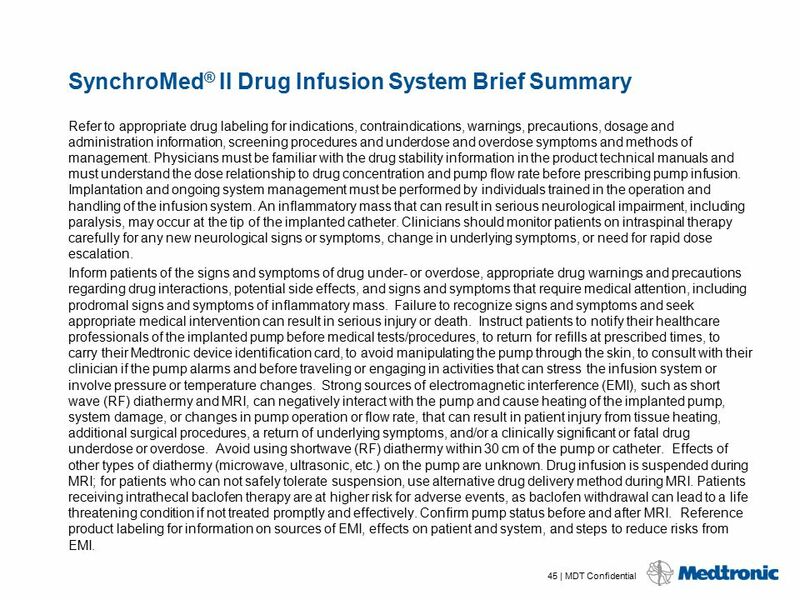 Drug infusion is suspended during MRI; for patients who can not safely tolerate suspension, use alternative drug delivery method during MRI. 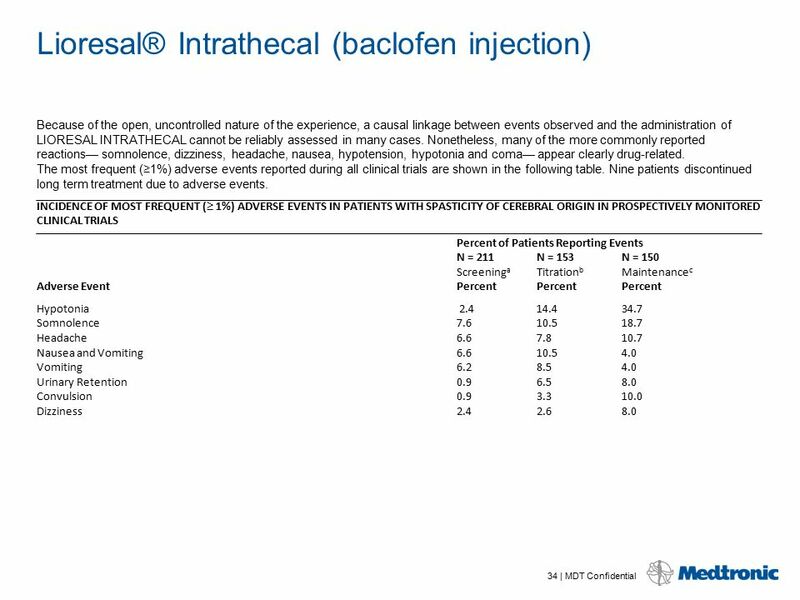 Patients receiving intrathecal baclofen therapy are at higher risk for adverse events, as baclofen withdrawal can lead to a life threatening condition if not treated promptly and effectively. Confirm pump status before and after MRI. Reference product labeling for information on sources of EMI, effects on patient and system, and steps to reduce risks from EMI. 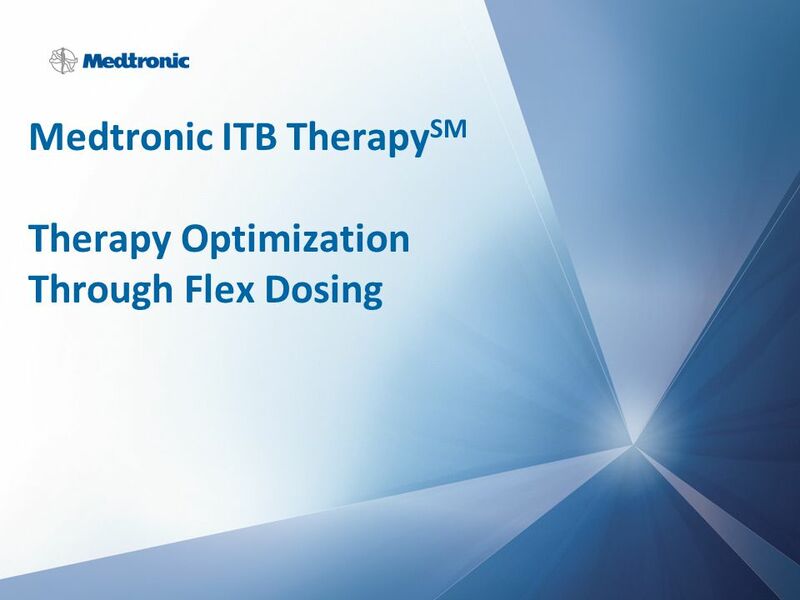 Download ppt "Medtronic ITB TherapySM Therapy Optimization Through Flex Dosing"
Hypertension Medications By: Elizabeth Rangel University of the Incarnate Word. Introduction to Clinical Pharmacology Chapter 9 Antibacterial Drugs That Interfere With DNA/RNA Synthesis. Diuretic Strategies in Patients with Acute Decompensated Heart Failure Diuretic Optimization Strategies Evaluation (DOSE) trial. 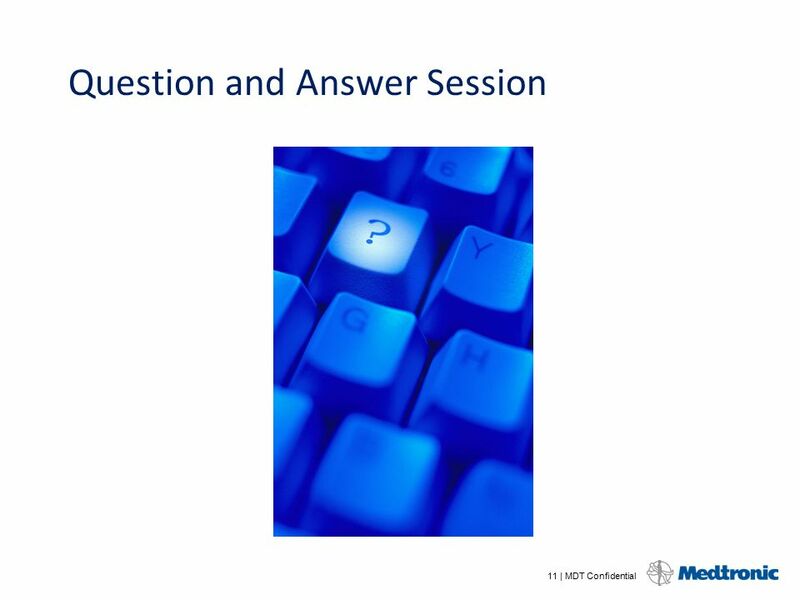 Medtronic ITB TherapySM Quick and Easy Troubleshooting for Catheter Complications Is the catheter working? Medication Regimen Review Guidance Training CFR § (c)(1)(2) F428. Botulinum toxin type A for the prevention of headaches in adults with chronic migraine. Acid-base disorders  Acid-base disorders are divided into two broad categories:  Those that affect respiration and cause changes in CO 2 concentration. Pharmacotherapy in the Elderly Paola S. Timiras May, 2007. Mosby items and derived items © 2007 by Mosby, Inc., an affiliate of Elsevier Inc. Chapter 11 Antianxiety Agents. BY: NURUL ISLAH BT MUZAKIR, PRP PRECEPTORS: MR LIM YONG YAN. Copyright © 2013, 2010 by Saunders, an imprint of Elsevier Inc. Chapter 25 Drugs for Muscle Spasm and Spasticity. 1 Lotronex ® (alosetron HCl) Tablets Risk-Benefit Issues Victor F. C. Raczkowski, M.D. Director, Division of Gastrointestinal and Coagulation Drug Products. Overview of Acetaminophen Label Warnings William E. Gilbertson, PharmD. Division OTC Drug Products 1.